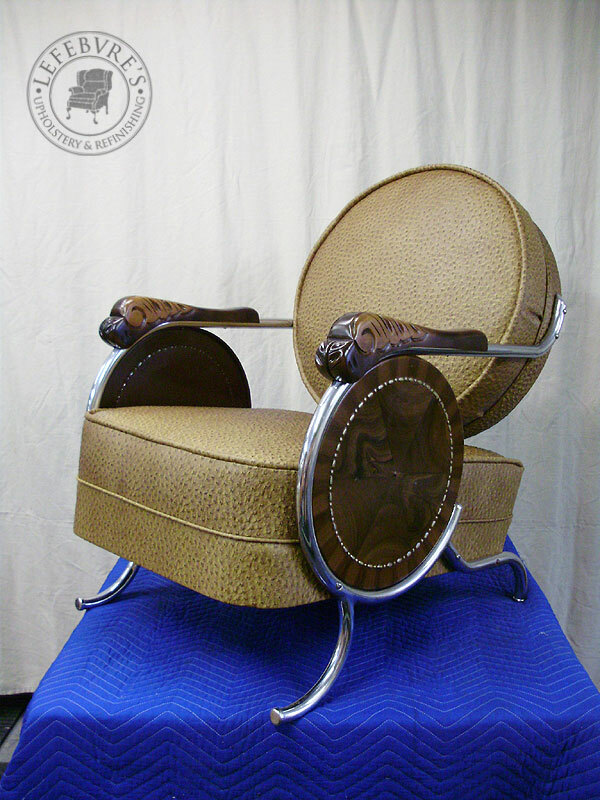 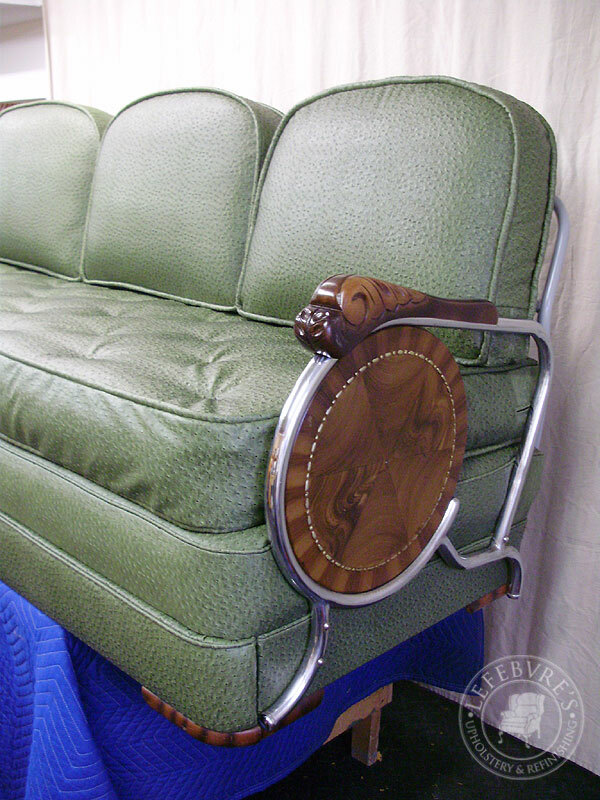 Here is a wonderful and unusual 1940s or 1950s chrome, and "faux bois" painted Sofa set, which has a roll-out hide-a-bed, and 2 matching chairs. 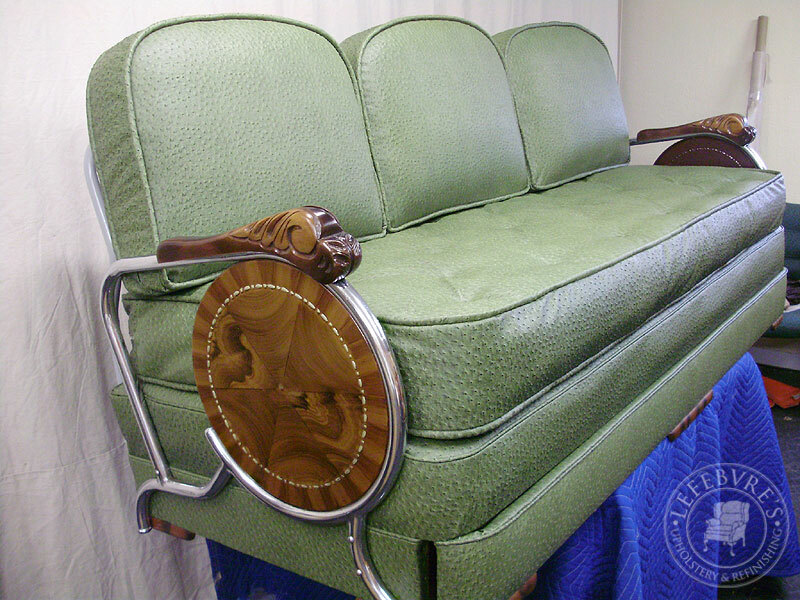 This was quite an unusual and interesting set. 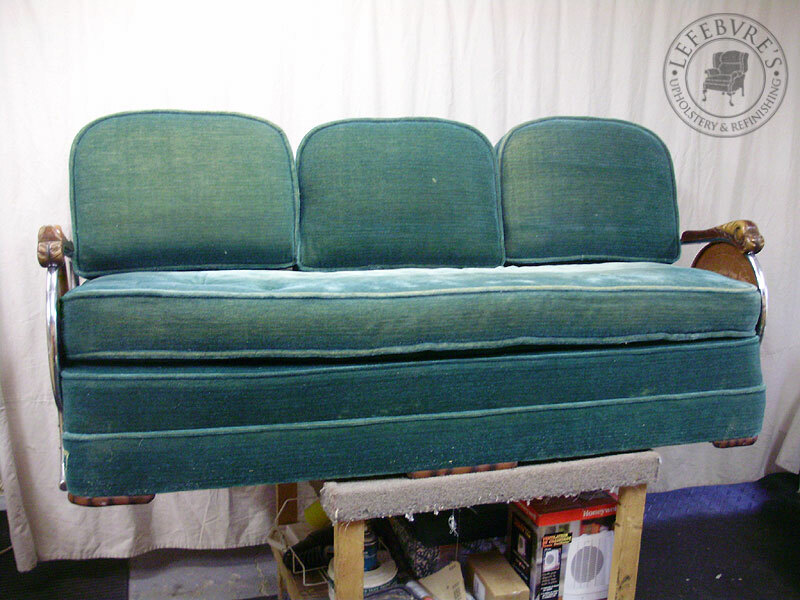 The set had a few issues with it. 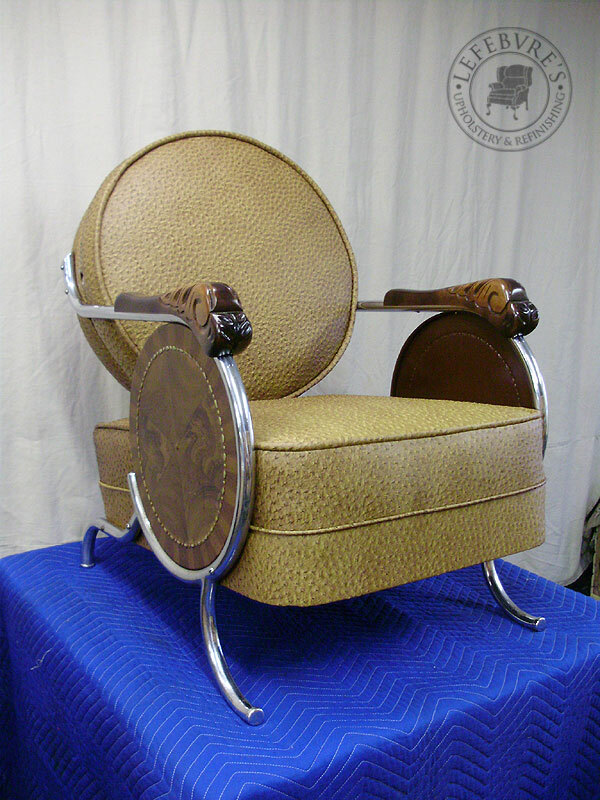 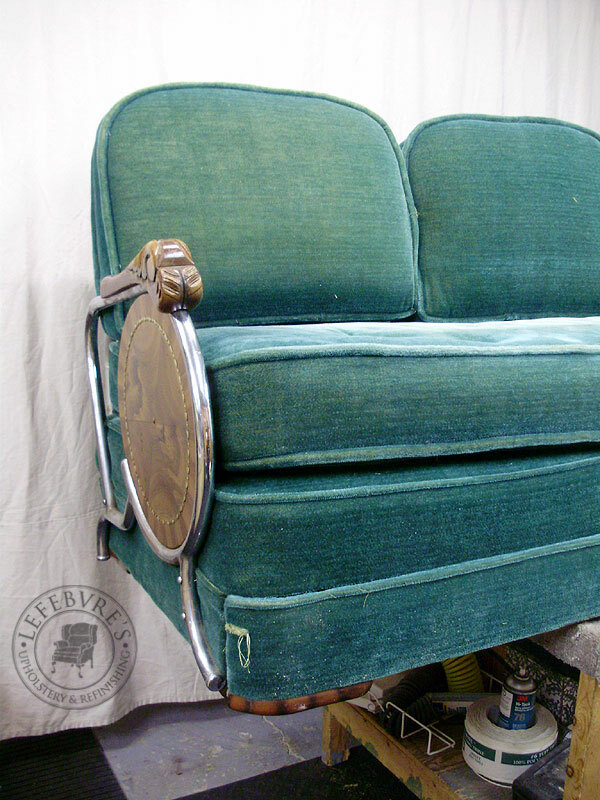 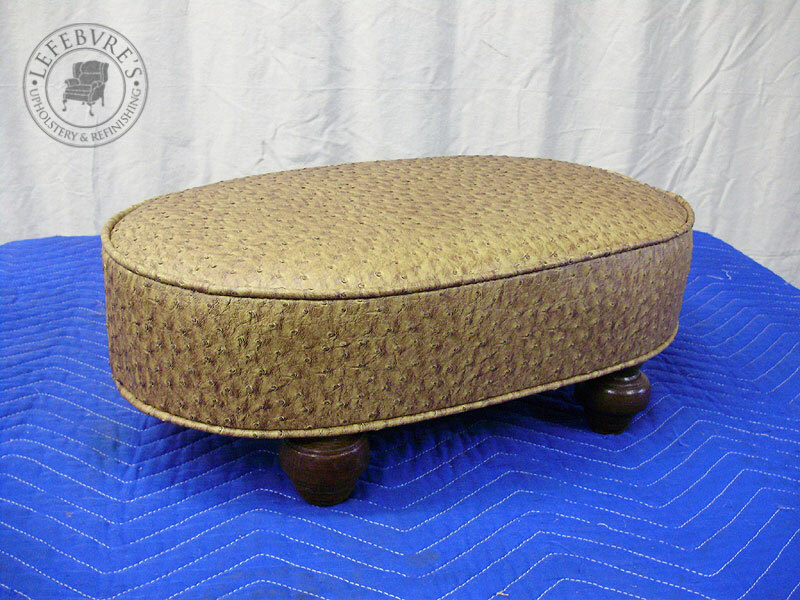 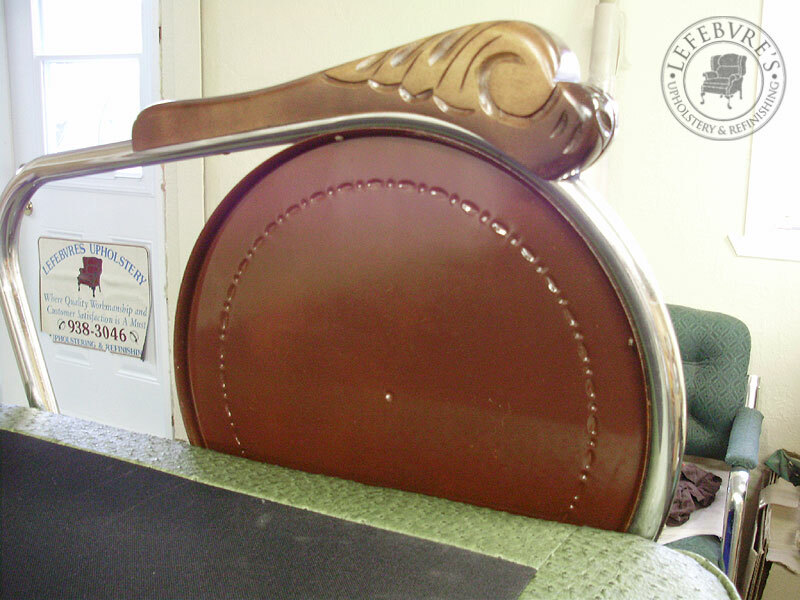 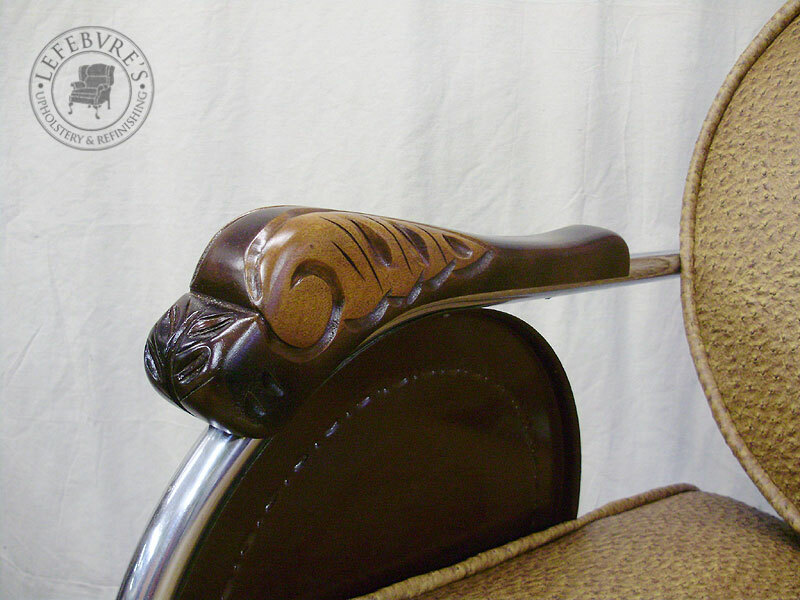 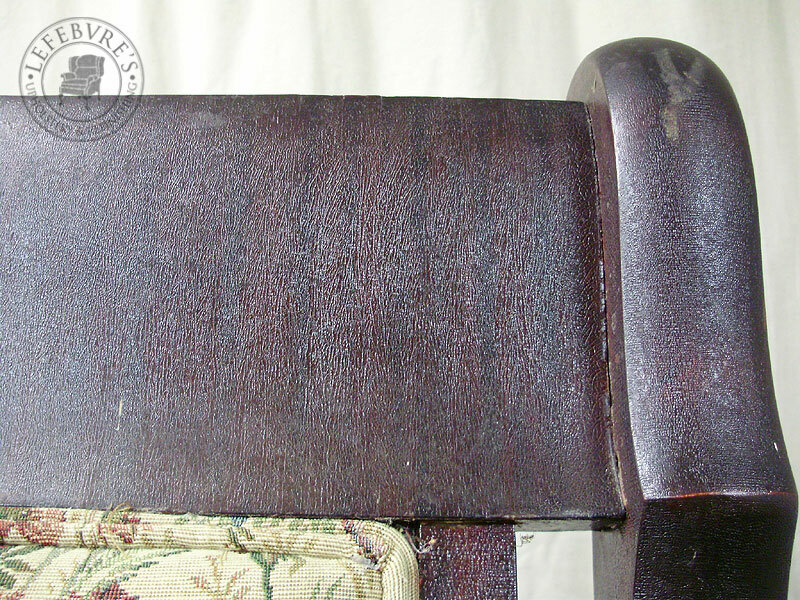 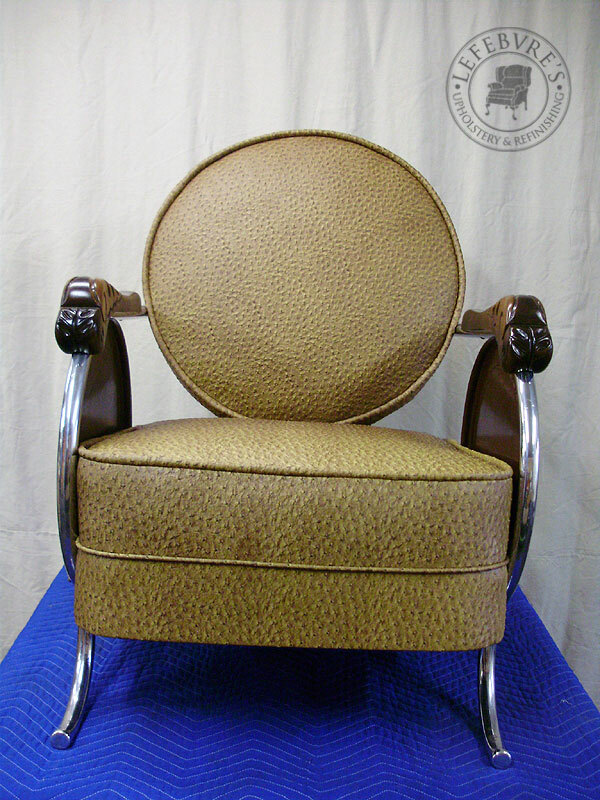 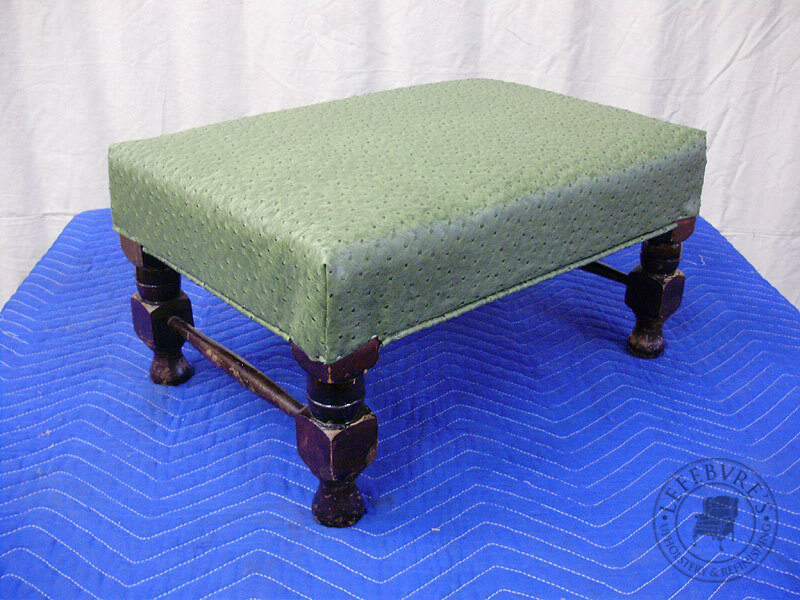 First, the upholstery was quite faded and worn in places, then there was a lot of scratching inside the circular side "pans" with the faux bois (wood grained) finish, and there were also a LOT of missing buttons that the owner wanted to have put back. 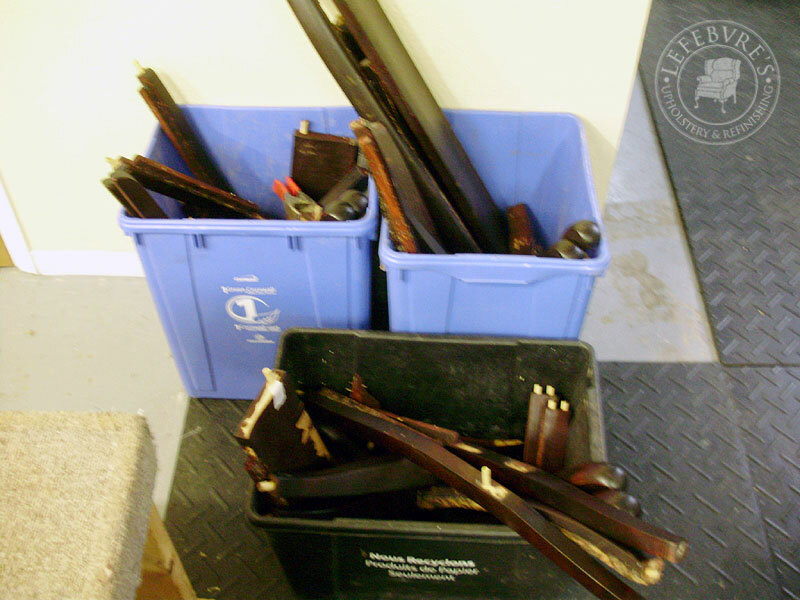 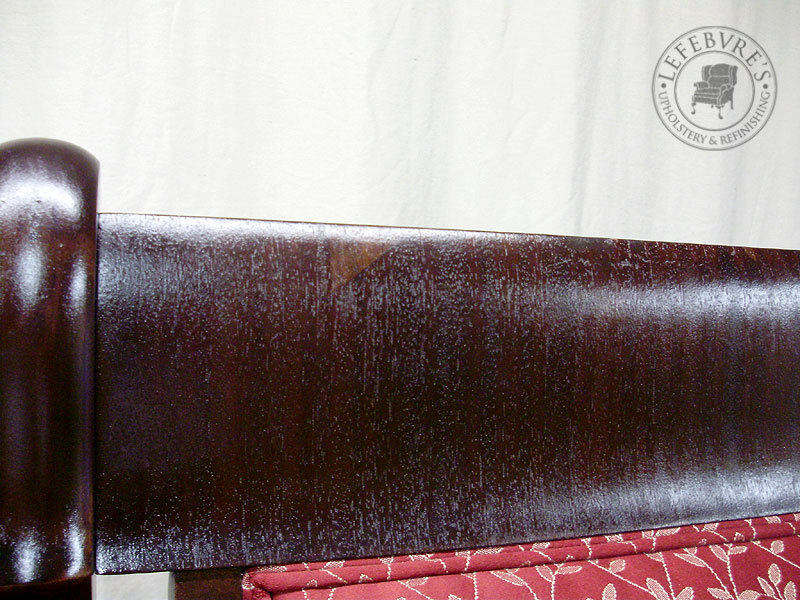 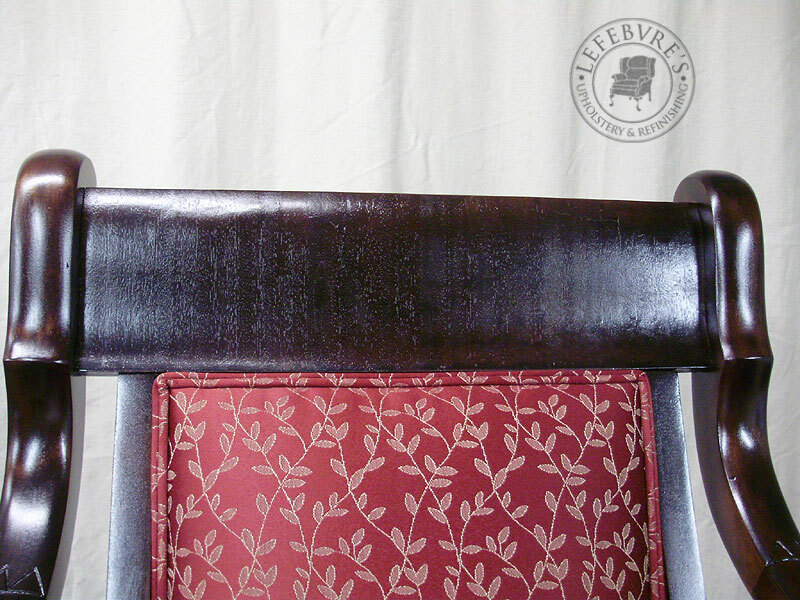 The arm tops were also badly flaking, and we stripped those and refinished them in the same 2-tone effect. 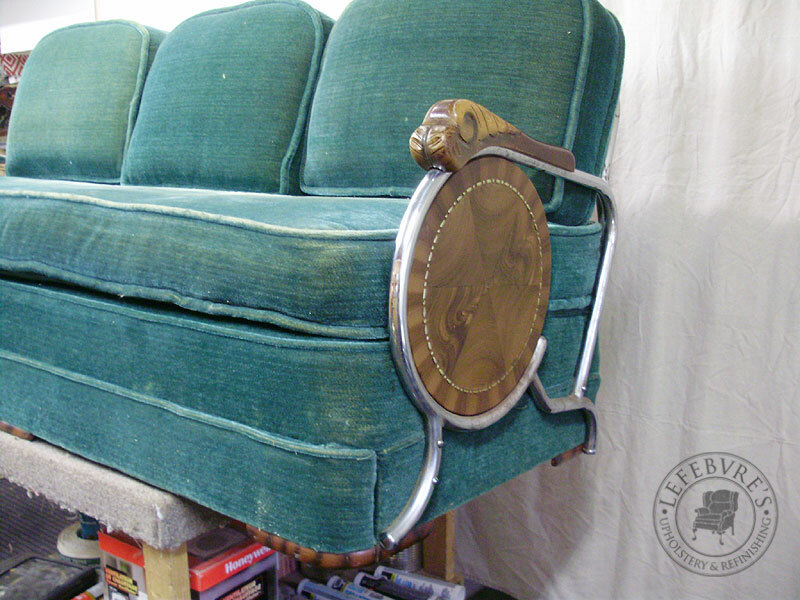 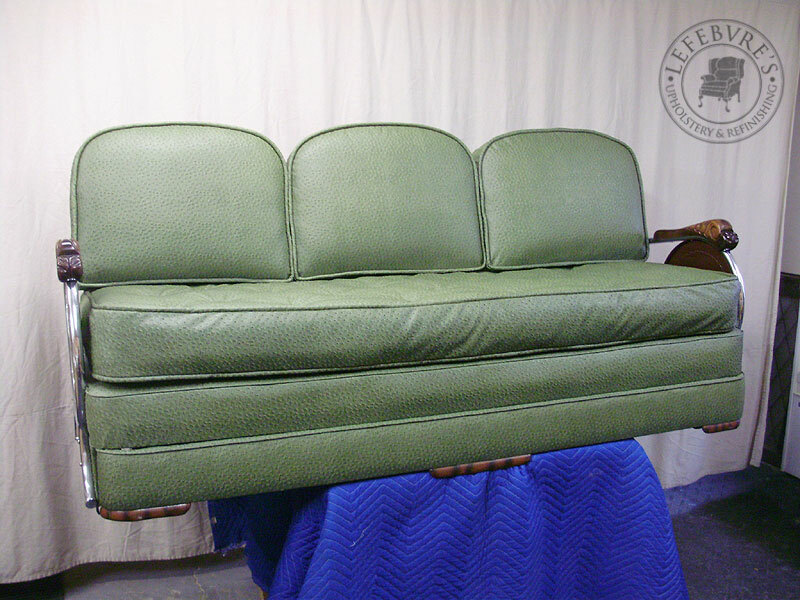 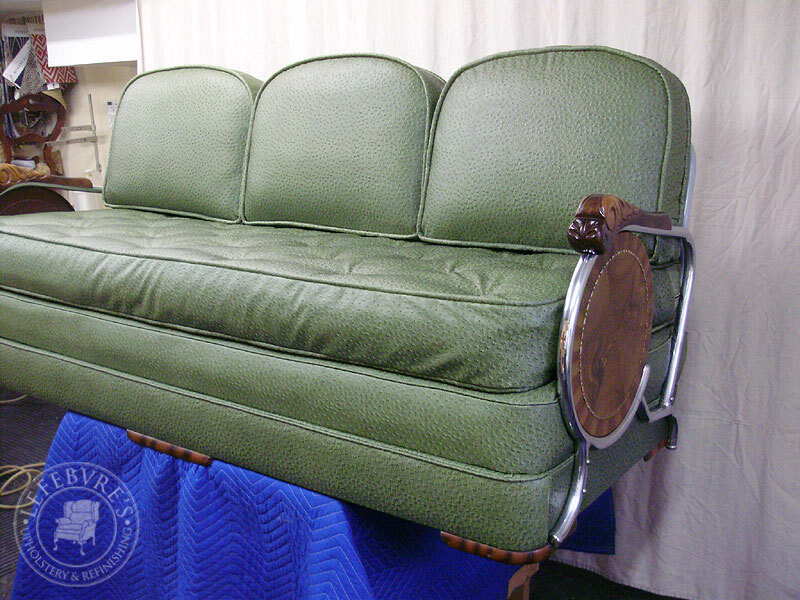 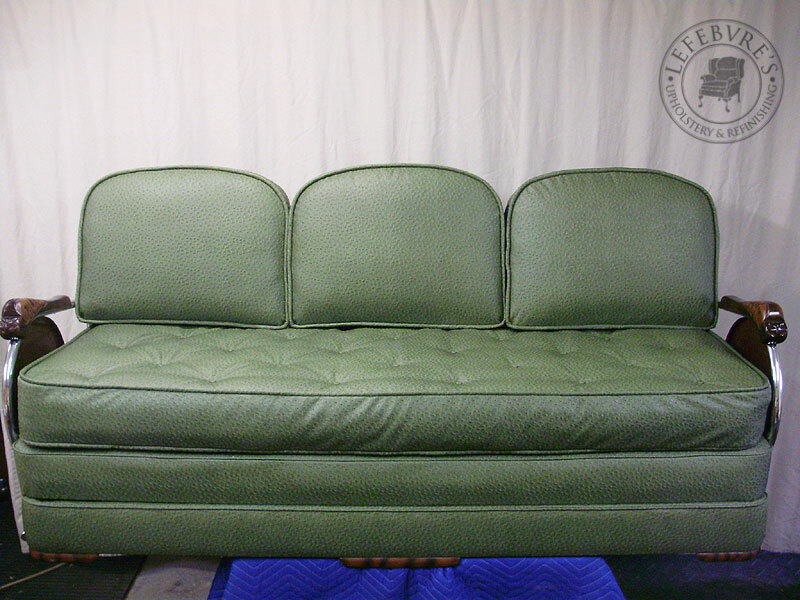 The owner chose a green "emu" pattern vinyl for the sofa, and a matching light brown for the two chairs. 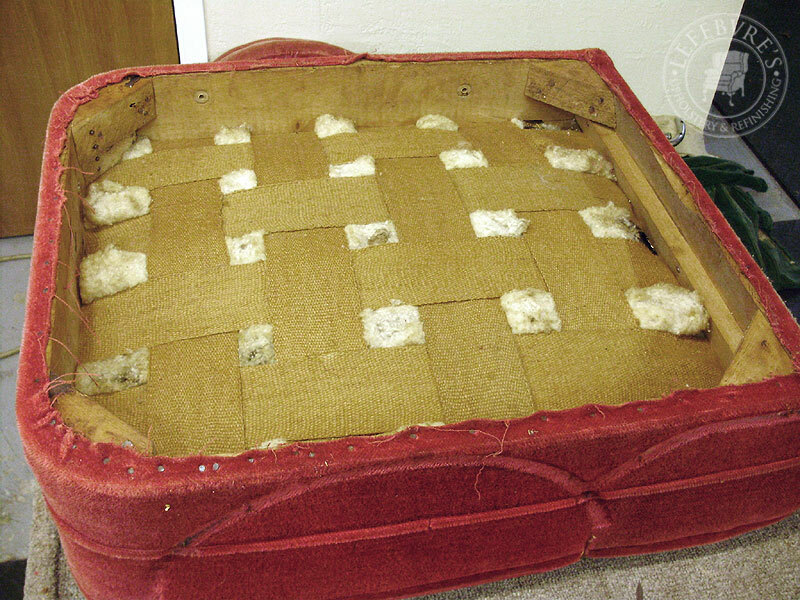 I believe there were only 2 or 3 buttons left out of 28. 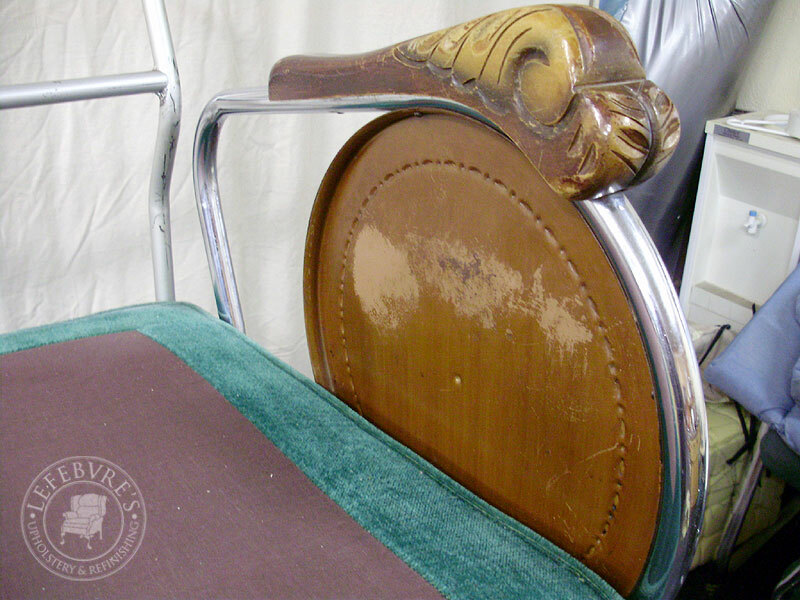 The back bracket was also repainted silver, since it was scratched, and has a few rust spots showing. 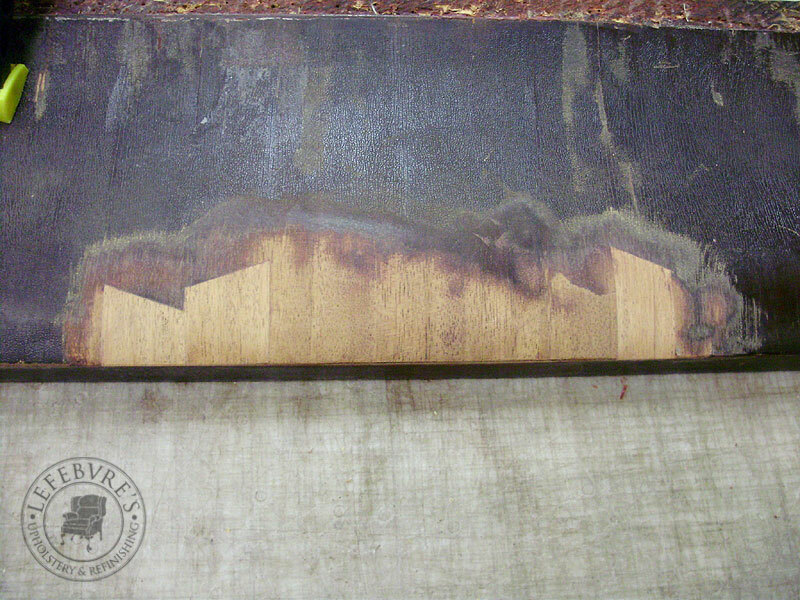 This shows some of the scratching on one of the 6 pans. 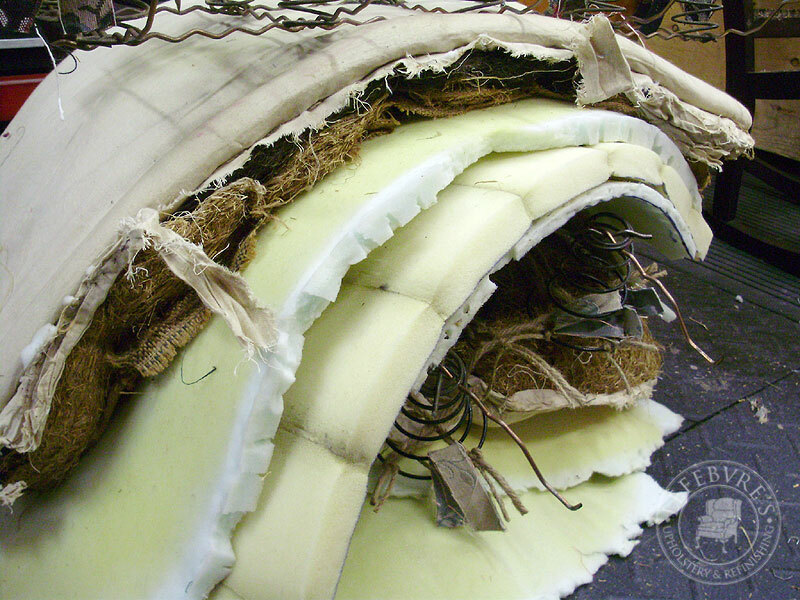 This may look like old dirt, but it's simply padding that's been set against the webbing to keep the springs quiet. 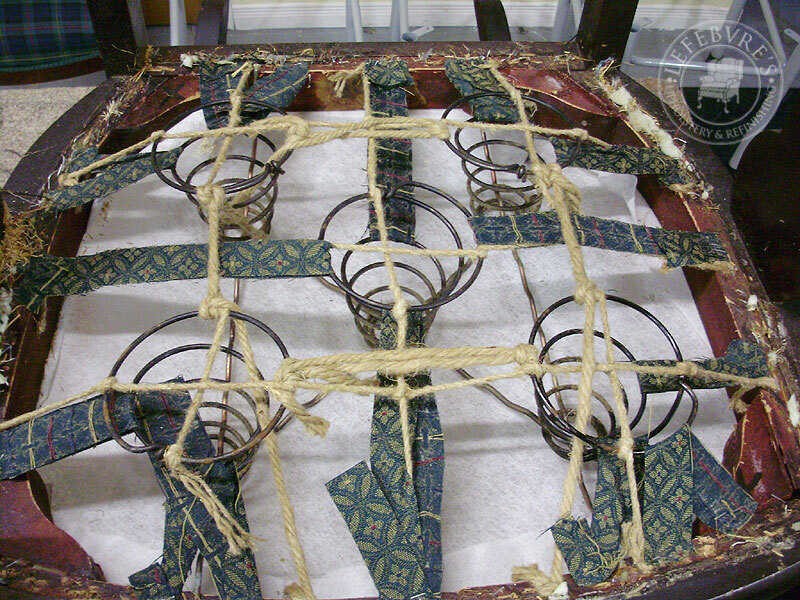 This shows the underside of one of the chair frames before taking it apart. 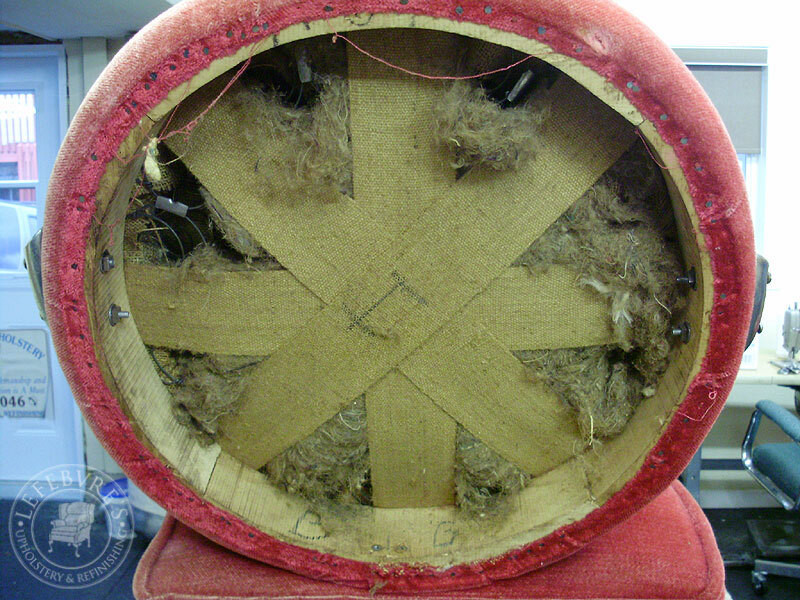 Note the cotton, which is between the springs and the webbing. 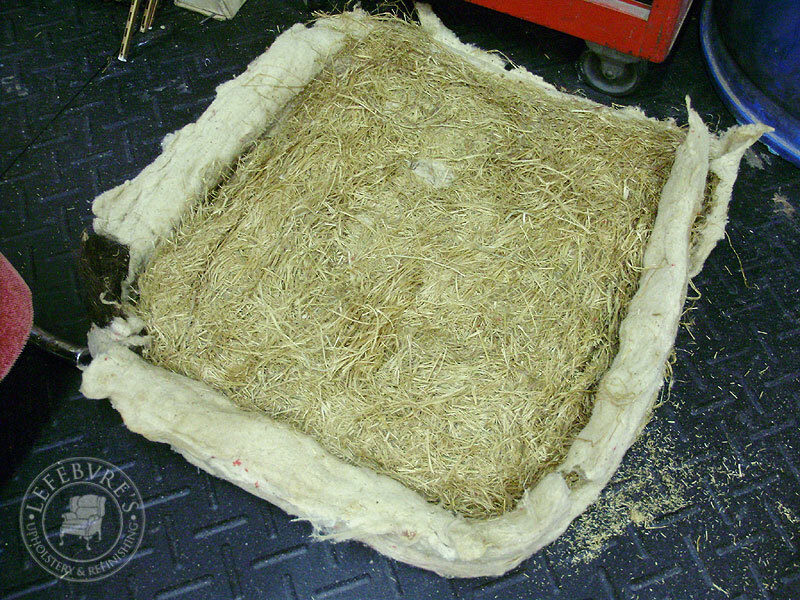 Old stuffing removed, showing the old base layers in need of new burlap. 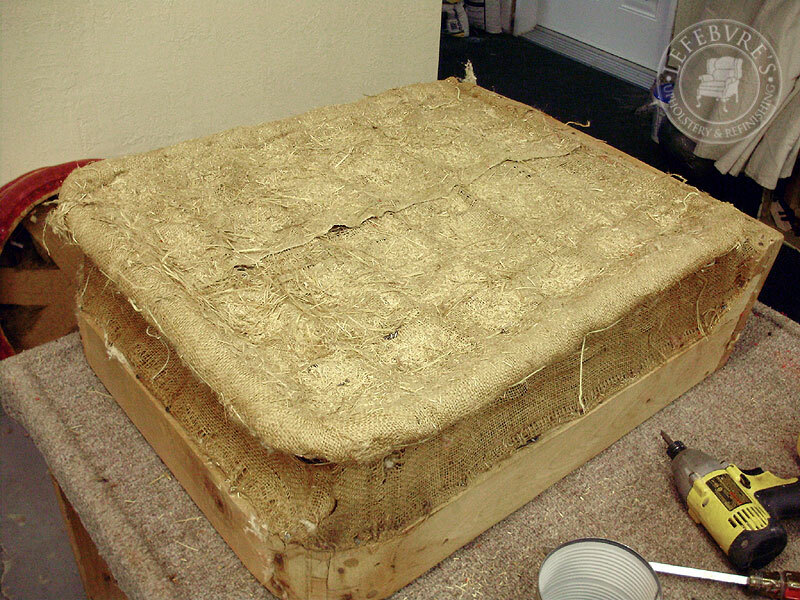 The original stuffing (which goes on top of the base in the previous photo, is simply straw and cotton (very common - and it lasts nearly forever). 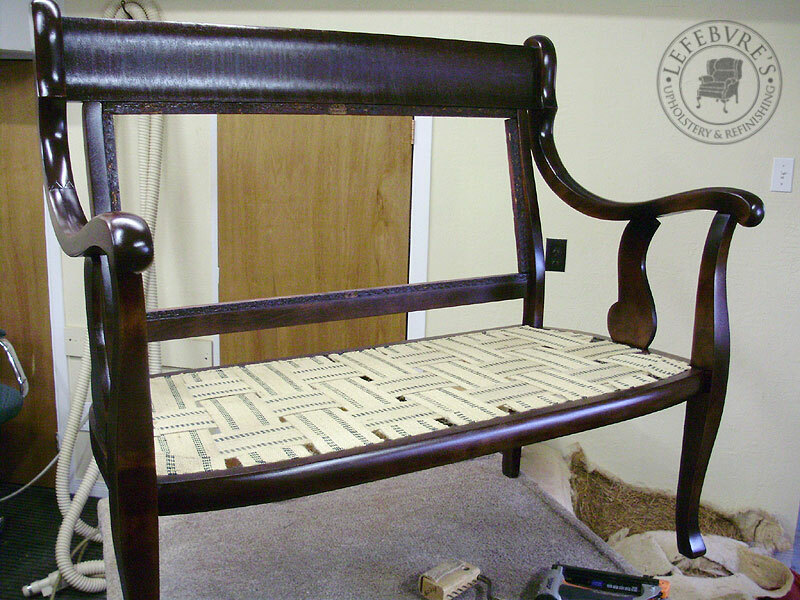 New webbing, spring "cage" reinstalled, with new burlap. 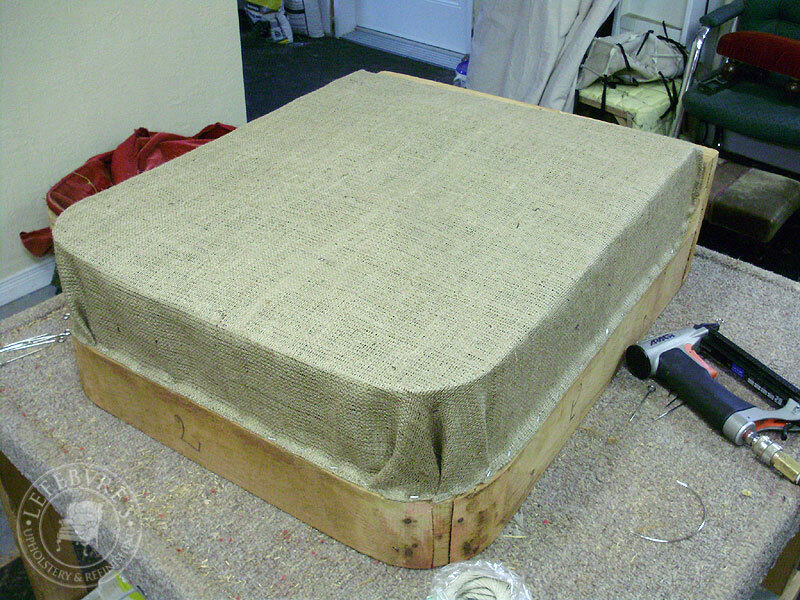 Existing edge roll reinstalled with new burlap (hand stitched). 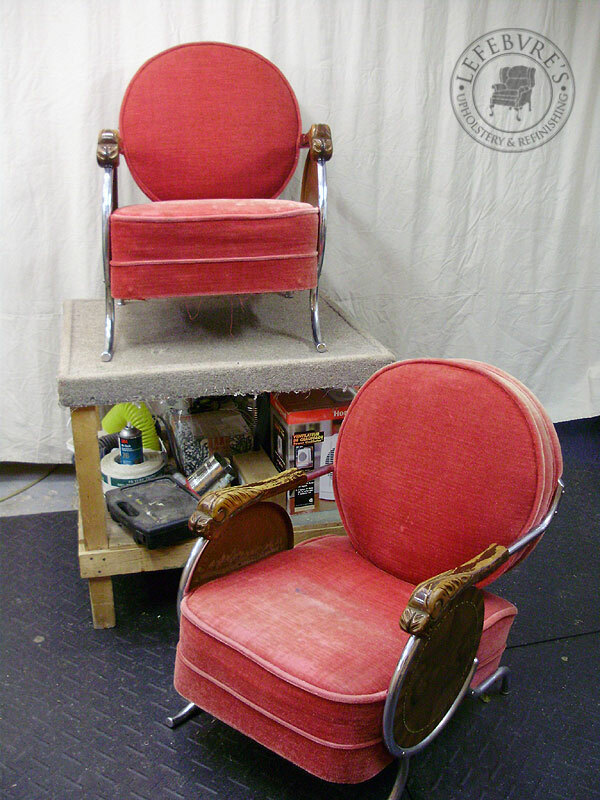 And here's the completed set. 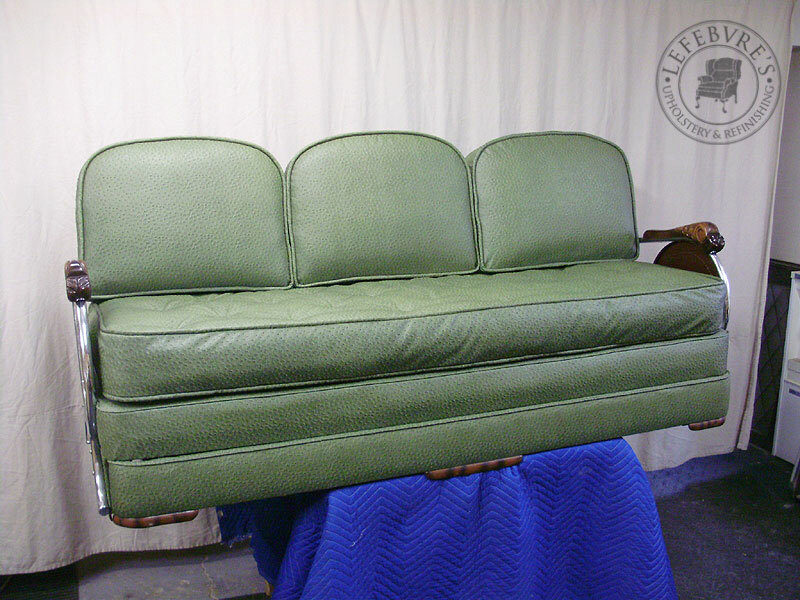 Refinished arm tops, repainted pan interiors (dark brown), and new vinyl upholstery. 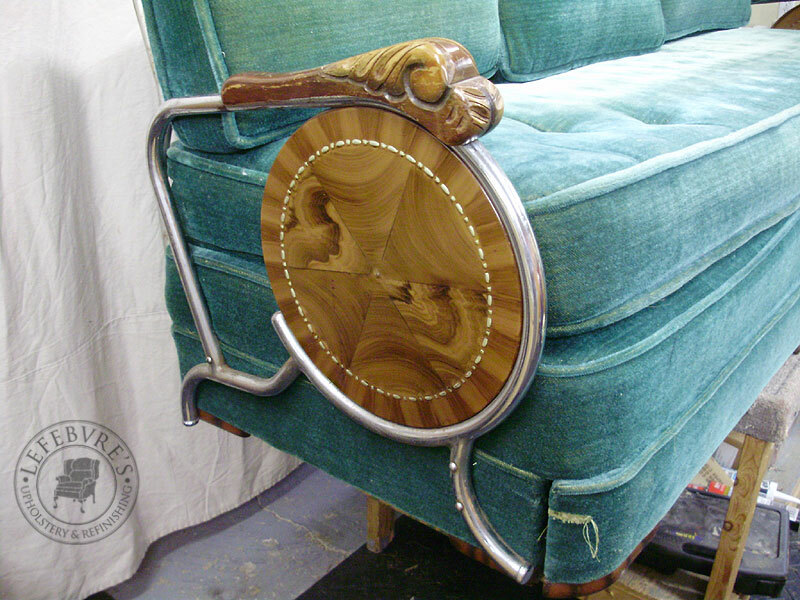 We also polished all the chrome. 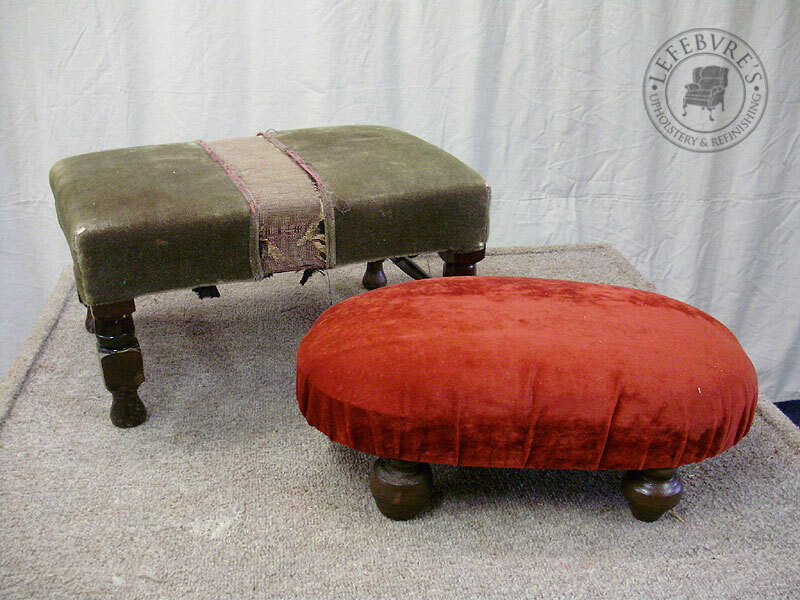 As a small side project to go with these, there were also two small ottomans. 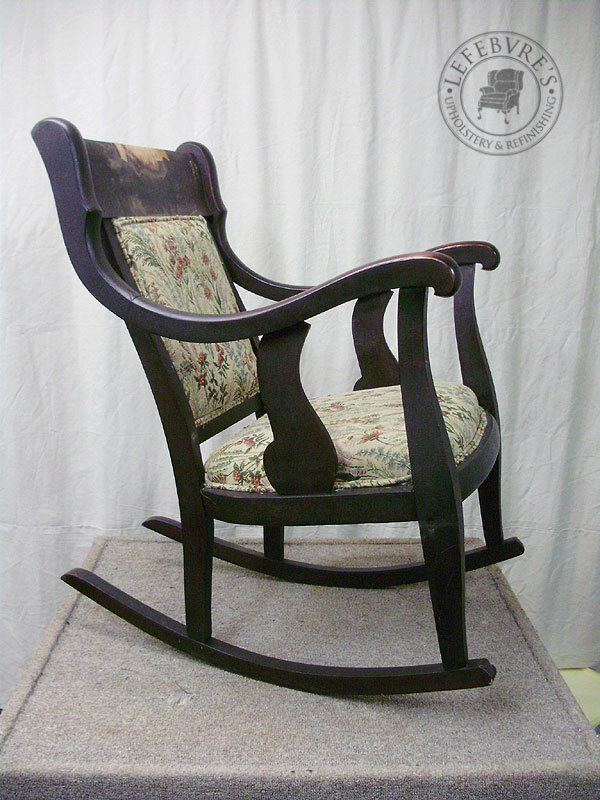 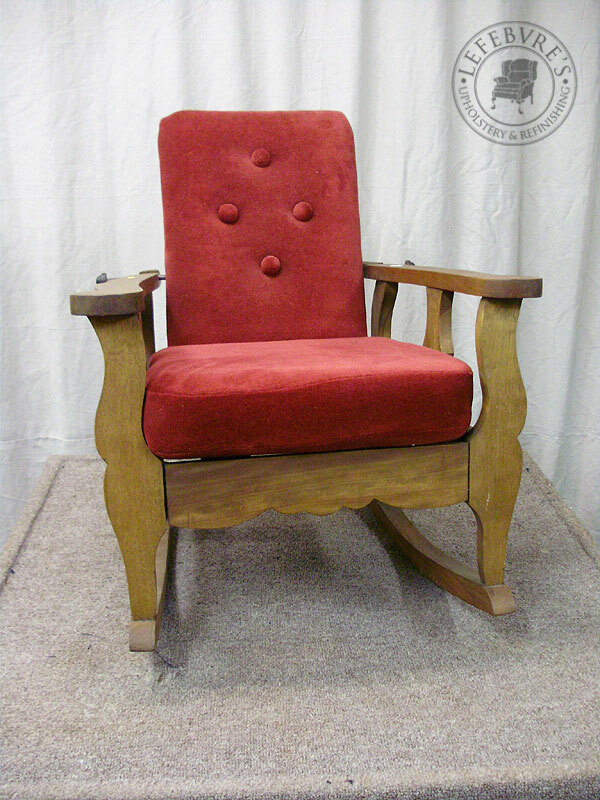 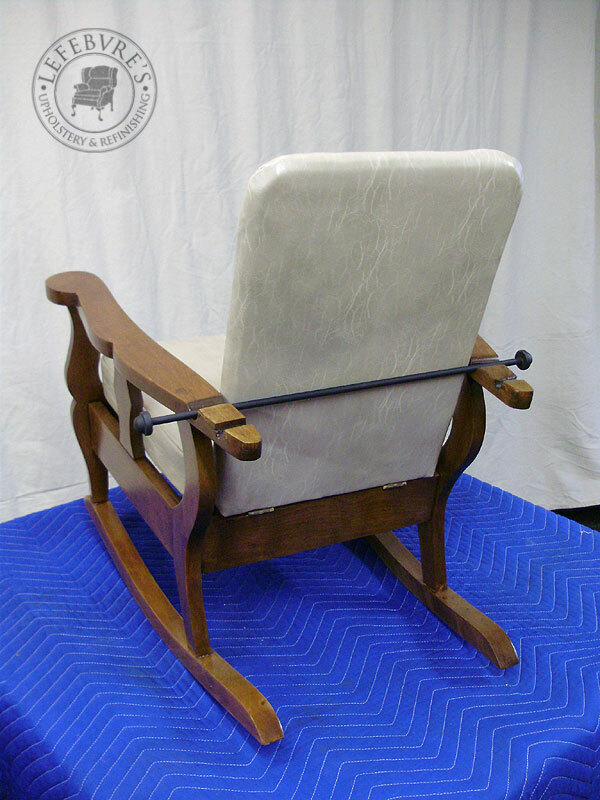 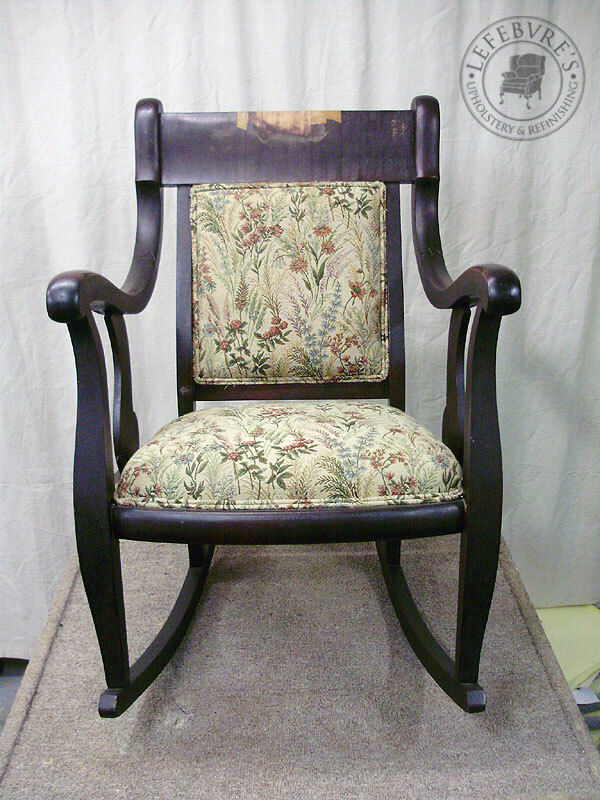 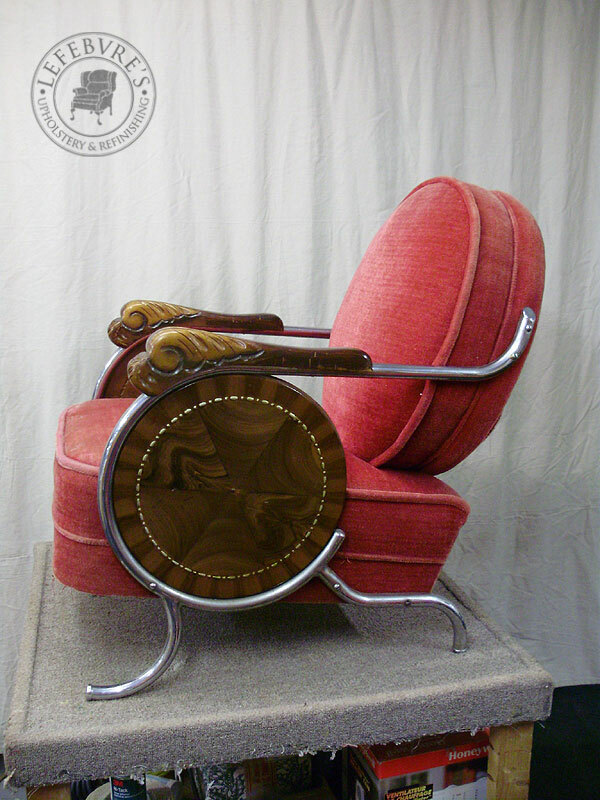 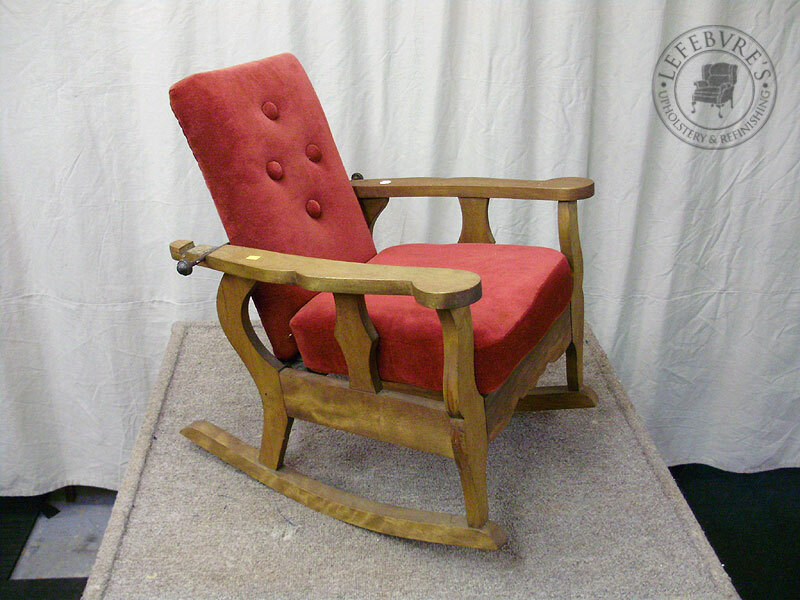 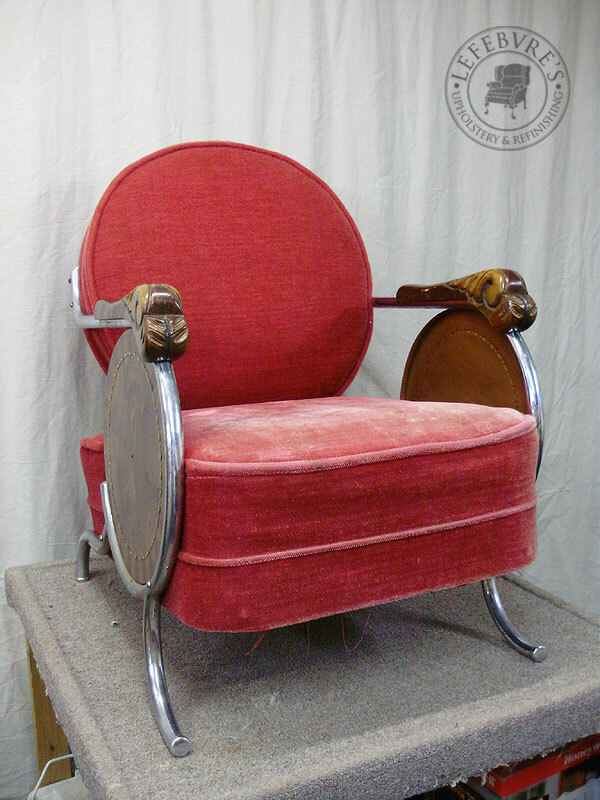 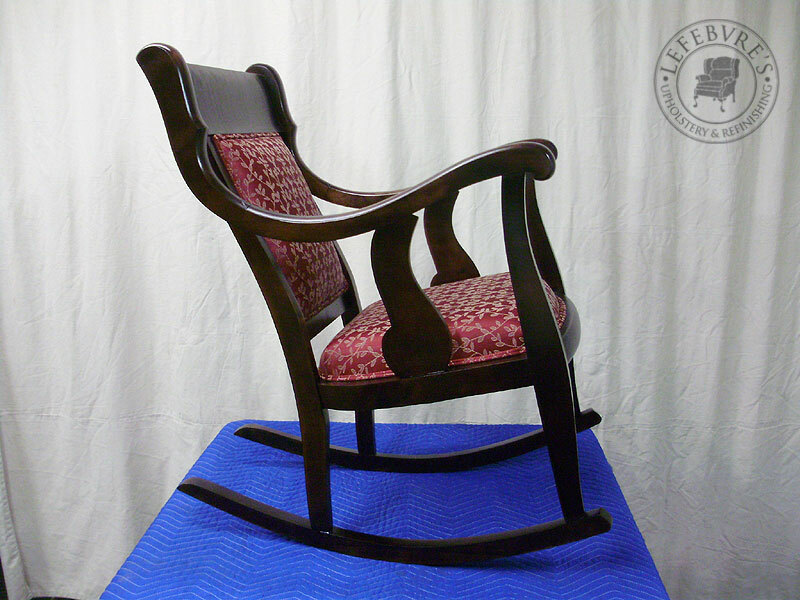 Here is a very unusual child's Morris style chair. 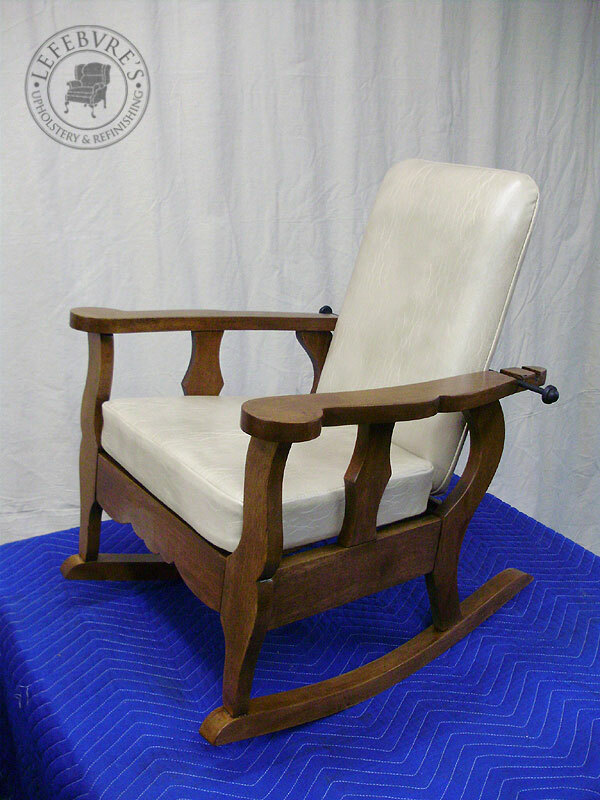 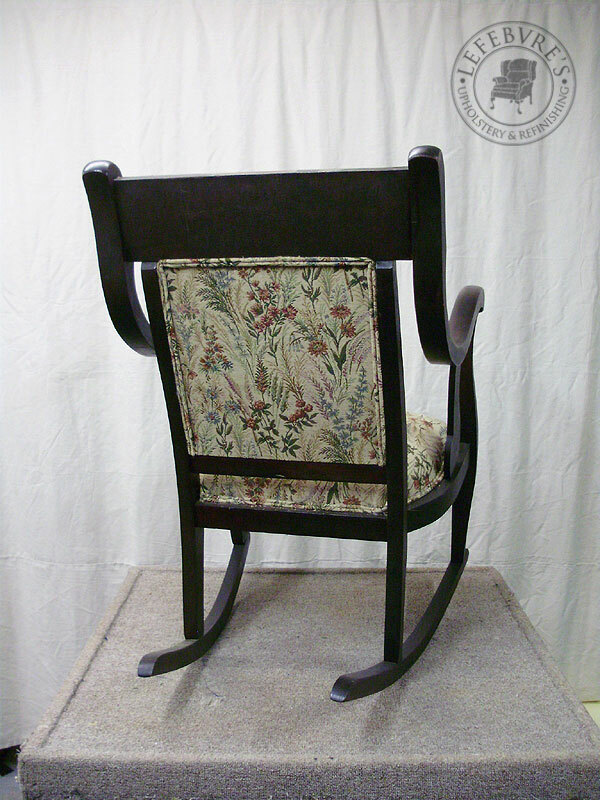 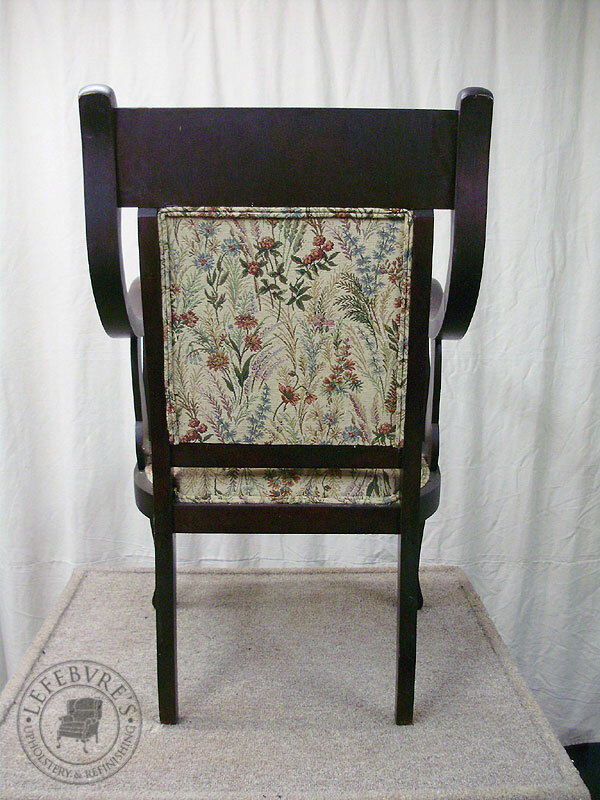 The frame on it is birch, and it has an adjustable back rest just like on larger Morris chairs. 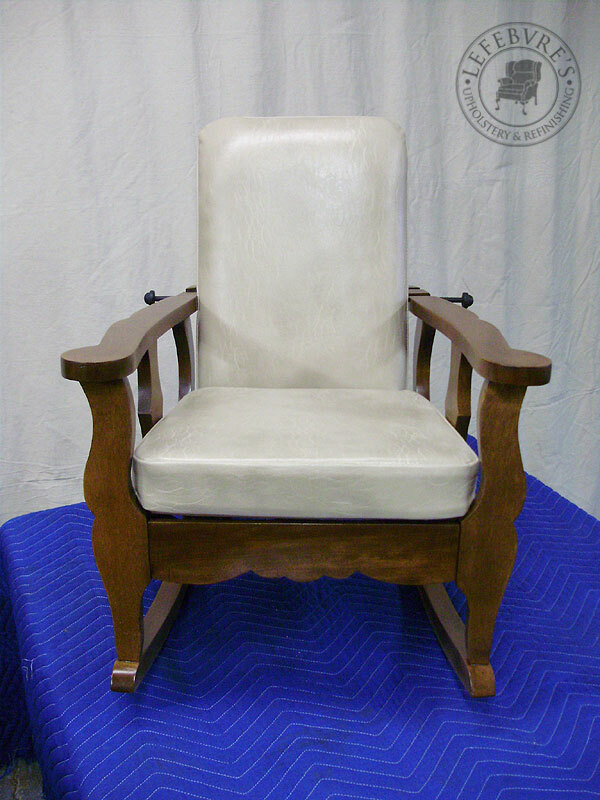 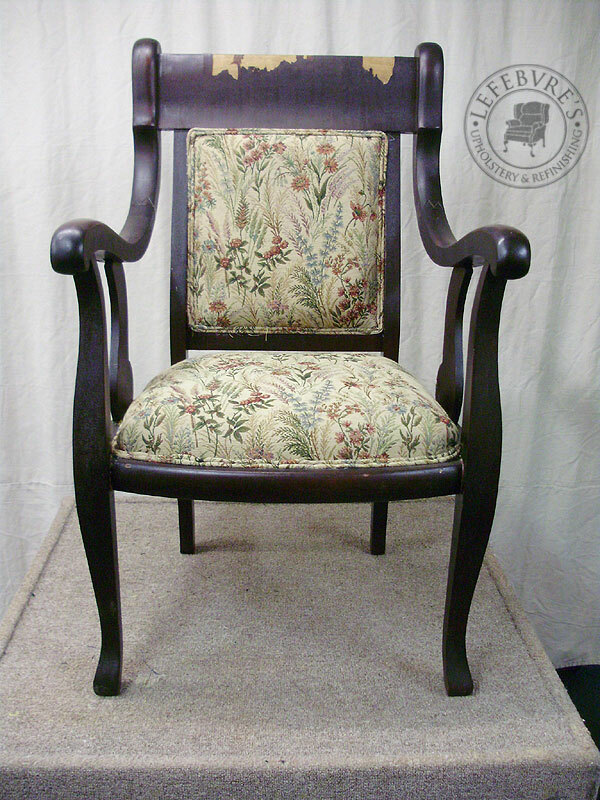 The owner wanted the chair refinished in a slightly darker shade (the chair had been stripped and refinished sometime in the past), and a new cover in a lather-look beige vinyl. 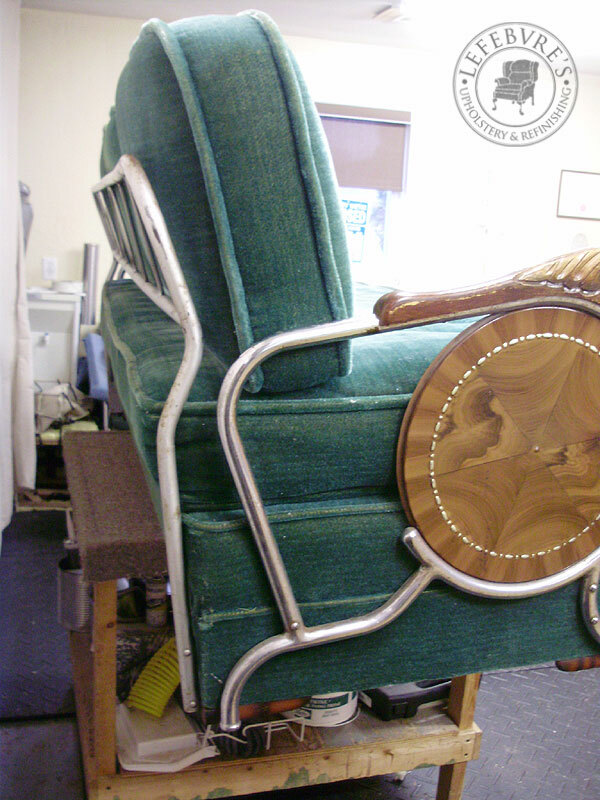 We also repainted the adjusting back rod in flat black. 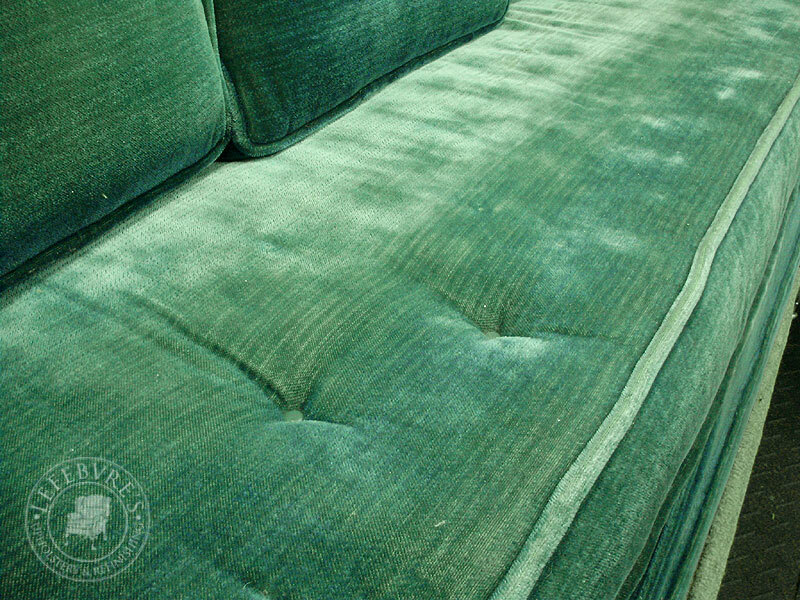 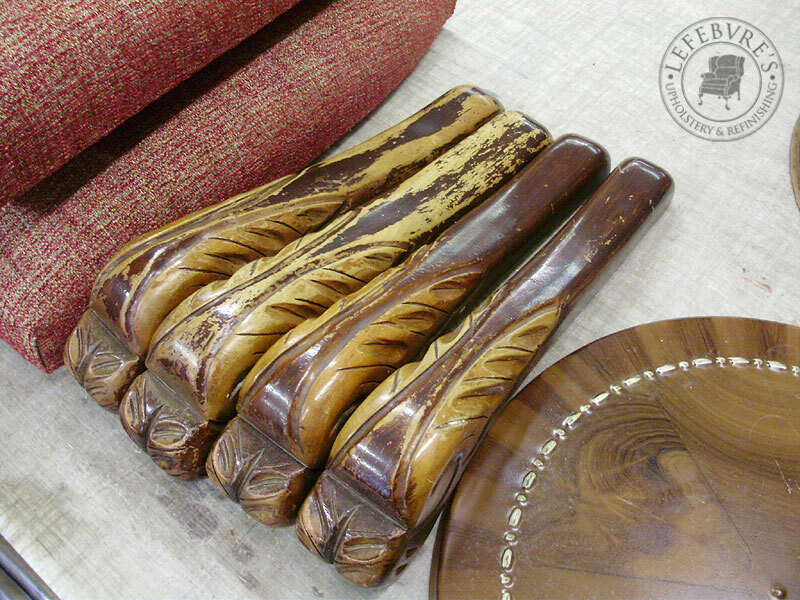 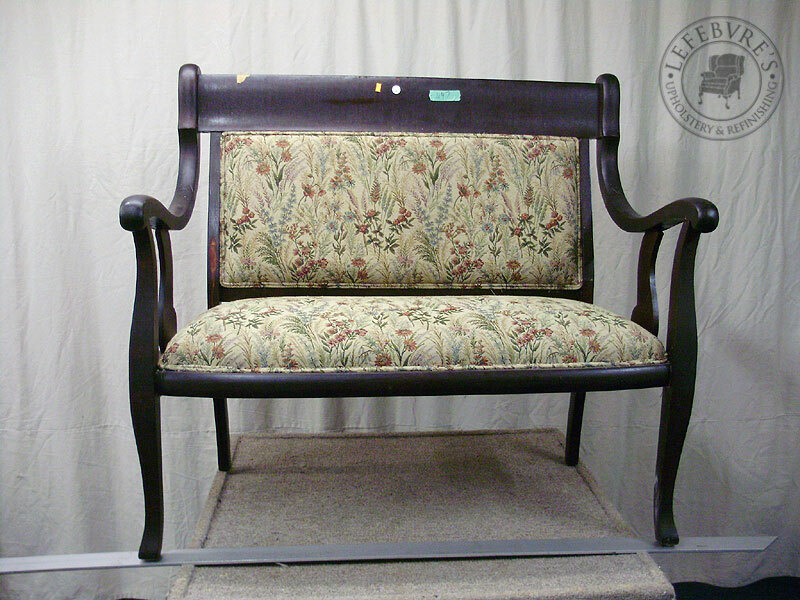 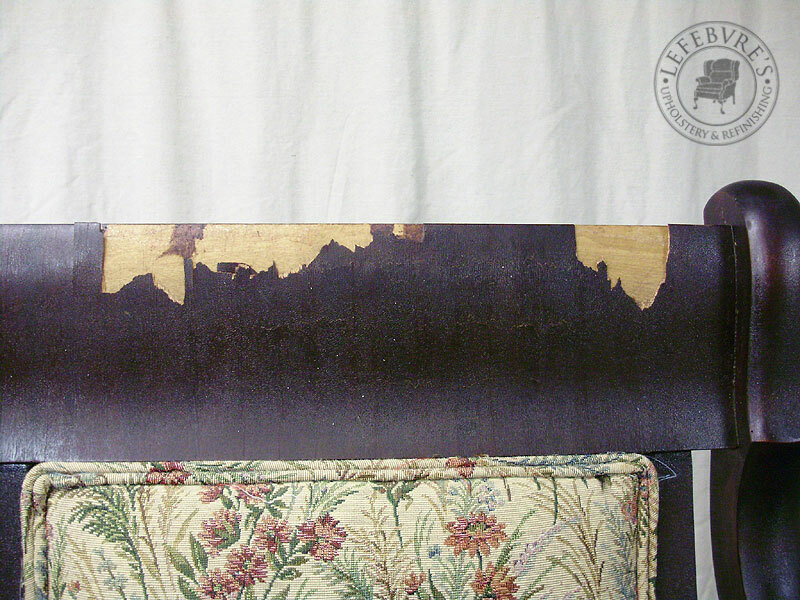 Here is another nice settee set found at auction, and in desperate need of repairs. 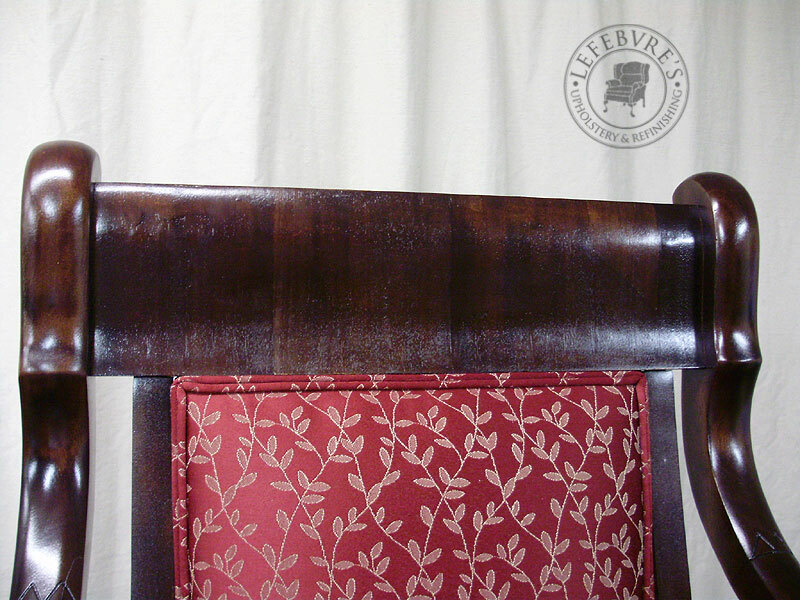 The new owner (same as the previous 4 chairs) wanted the old upholstery removed, with new foam installed, and to have the frames stripped down, repaired, and have the fragile veneer patched and repaired as best we could. 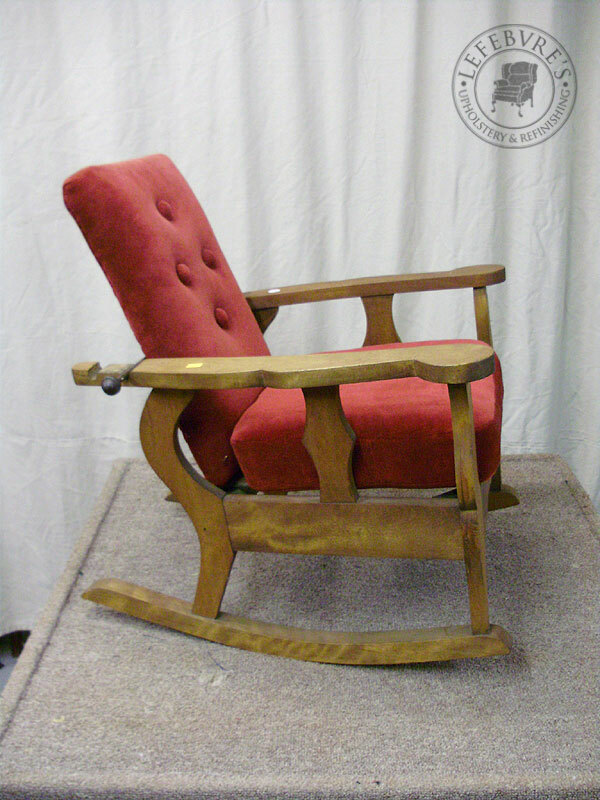 The set is likely from around the 1890s or early 1900s. 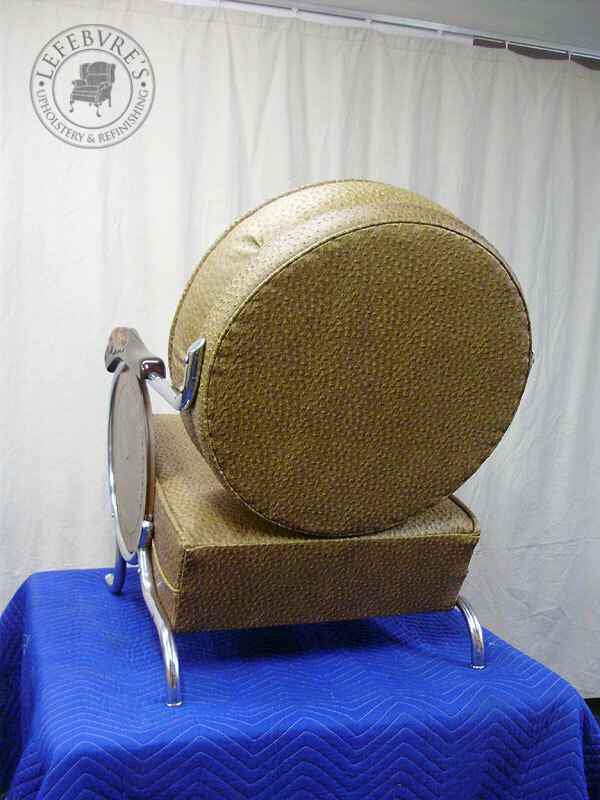 The upholstery that was on these chairs was a complete mess. 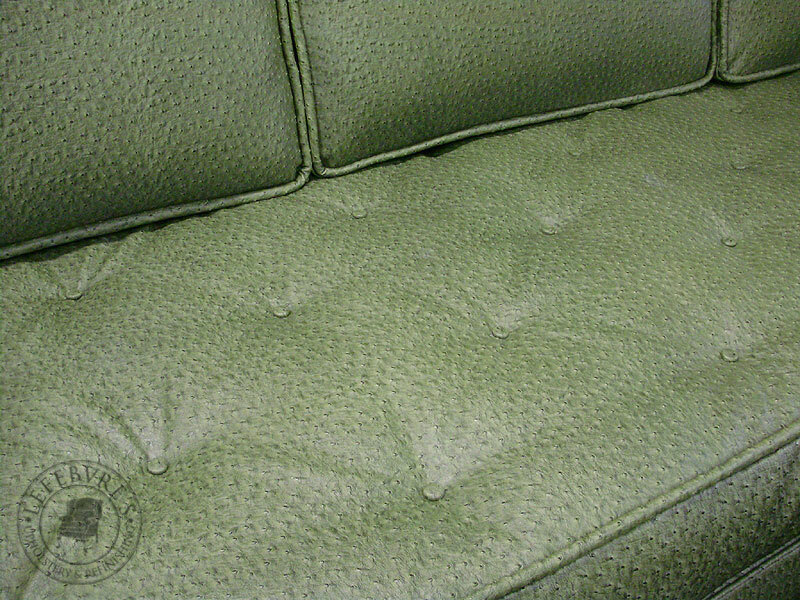 A complete mix of disintegrated old original stuffing, plus newer foam tossed over the older stuffing. 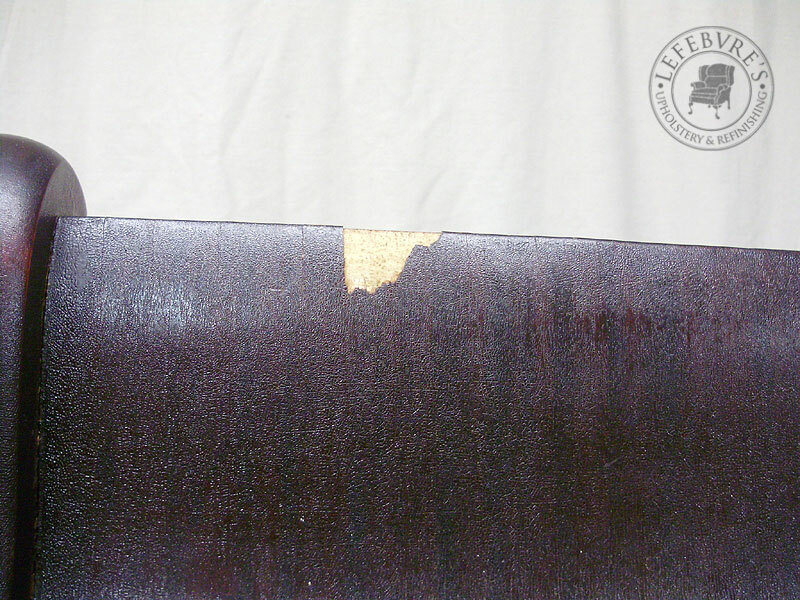 The 3 pieces were completely dismantled for repairs and refinishing. 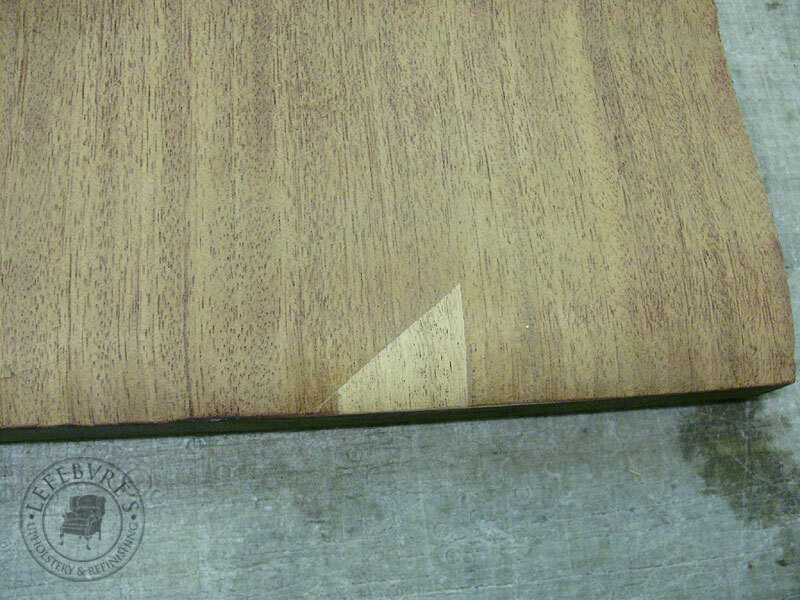 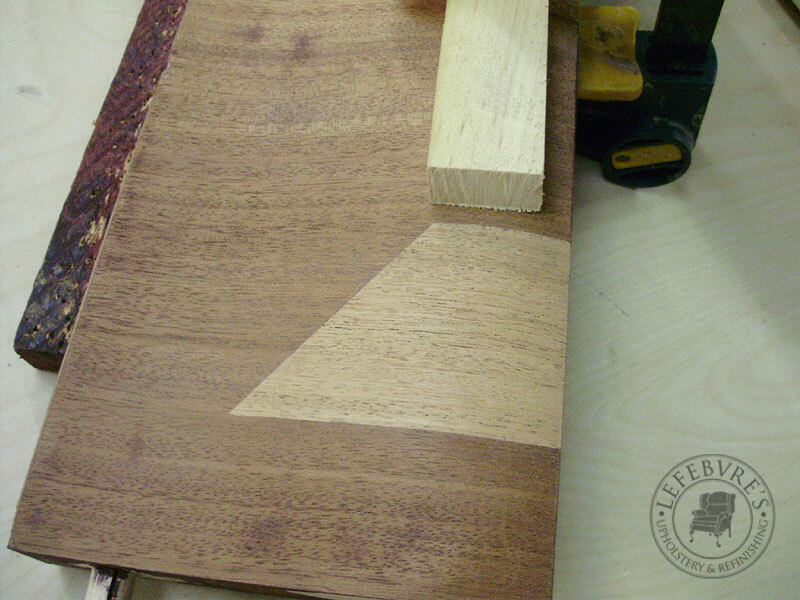 A lot of time was spent doing the repairs to the veneer, and regluing loose veneer that was lifting around the edges. 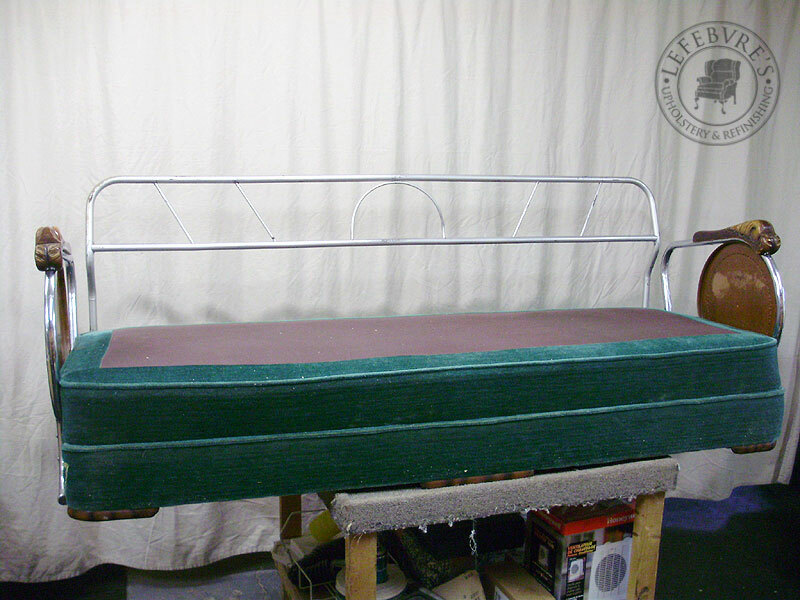 New webbing, followed by new foam (the owner did not want the springs reinstalled). 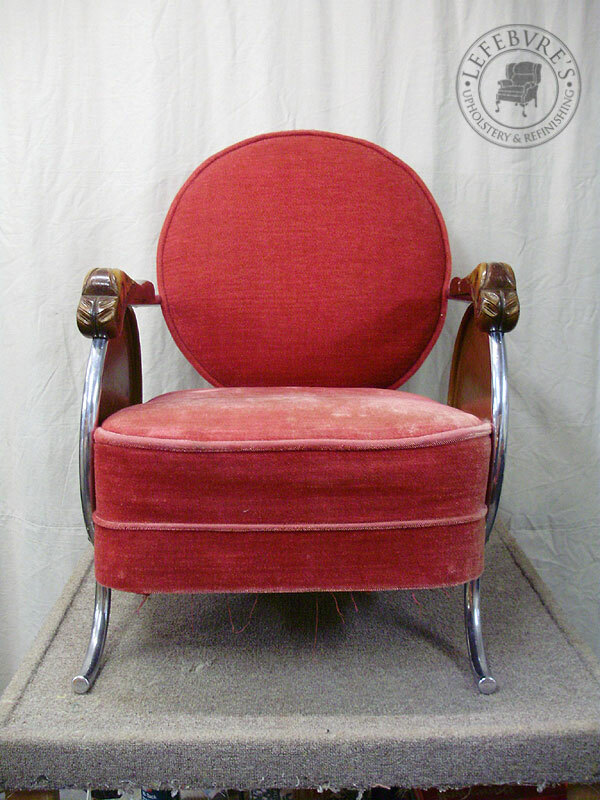 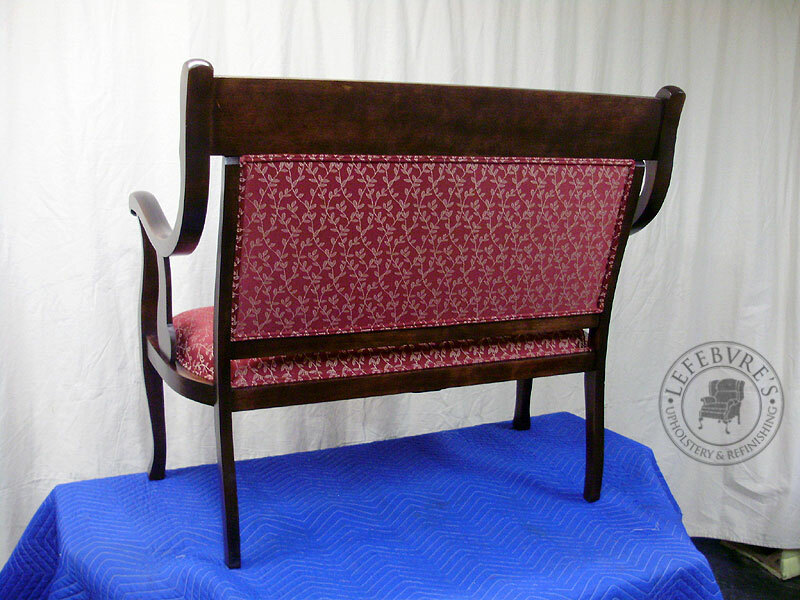 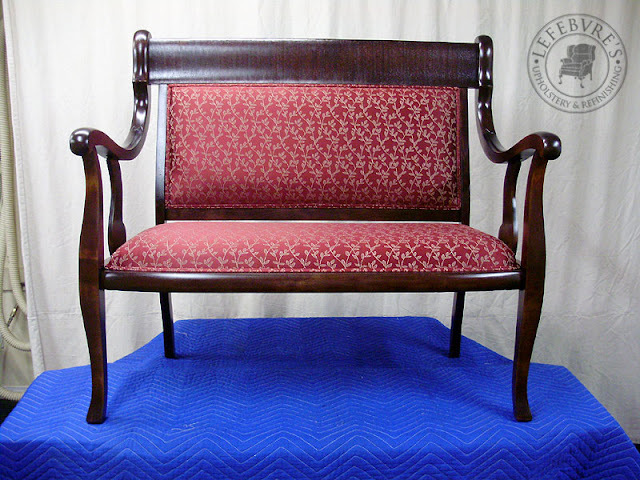 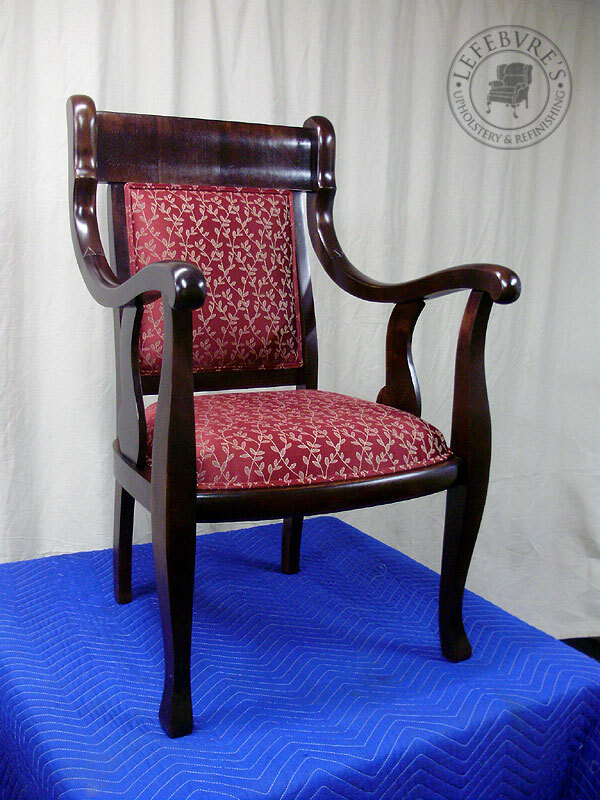 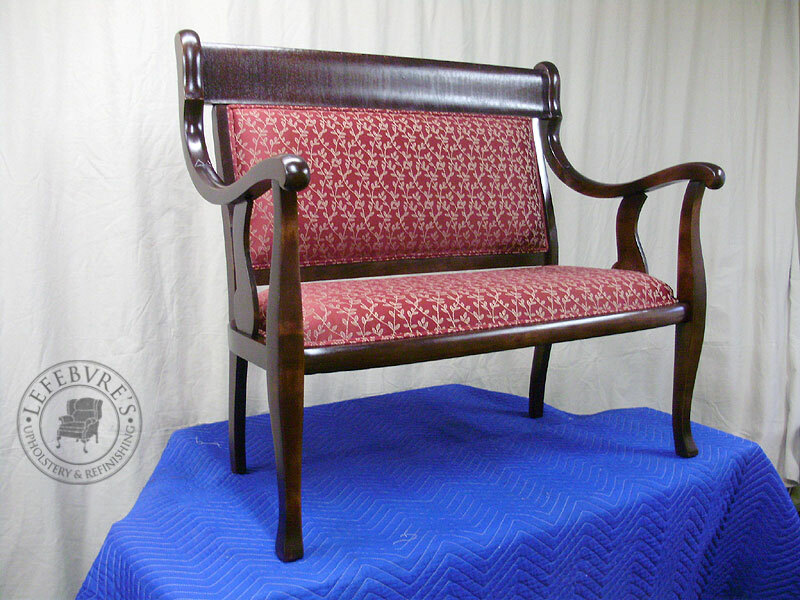 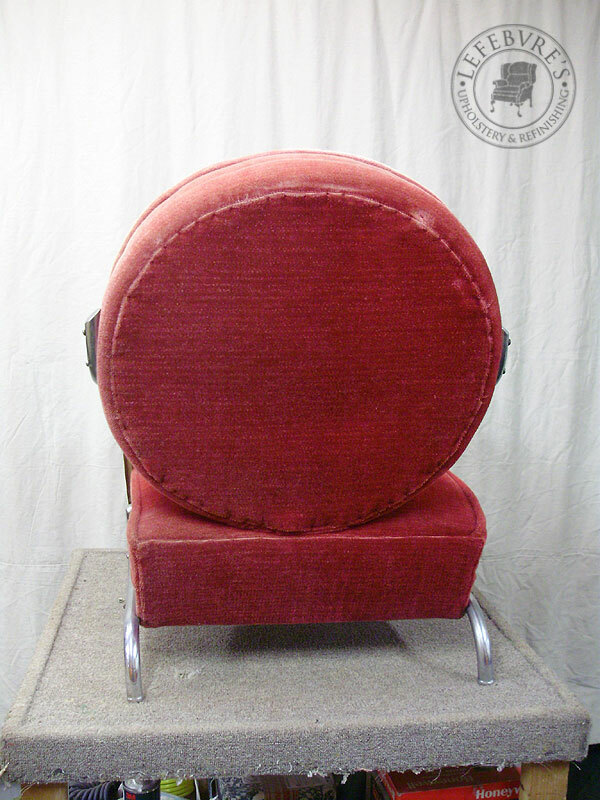 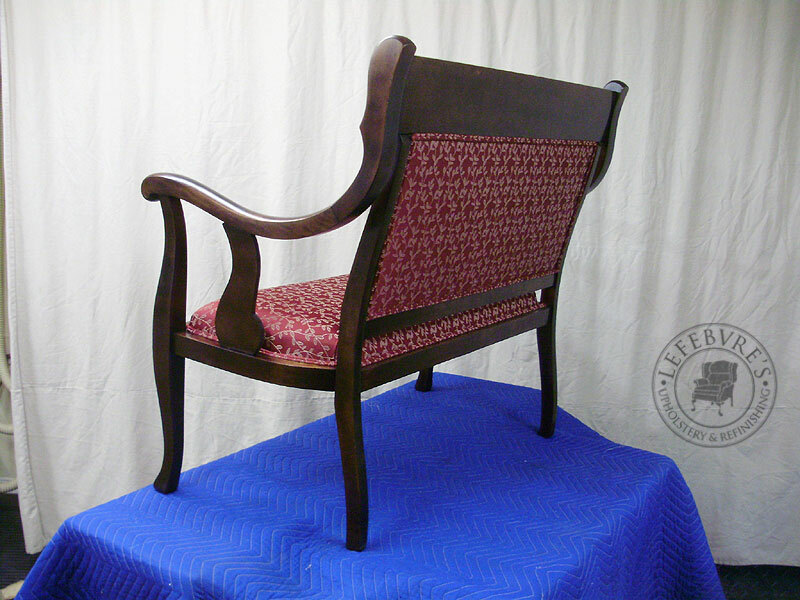 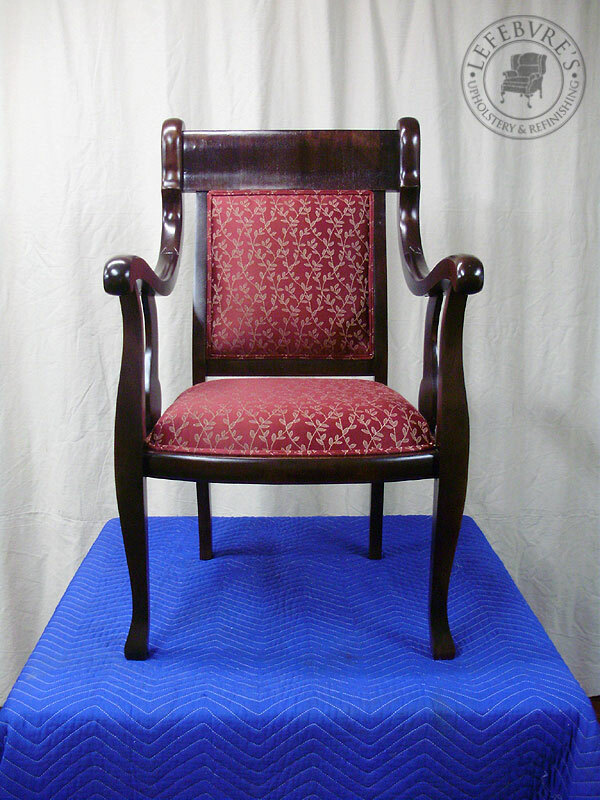 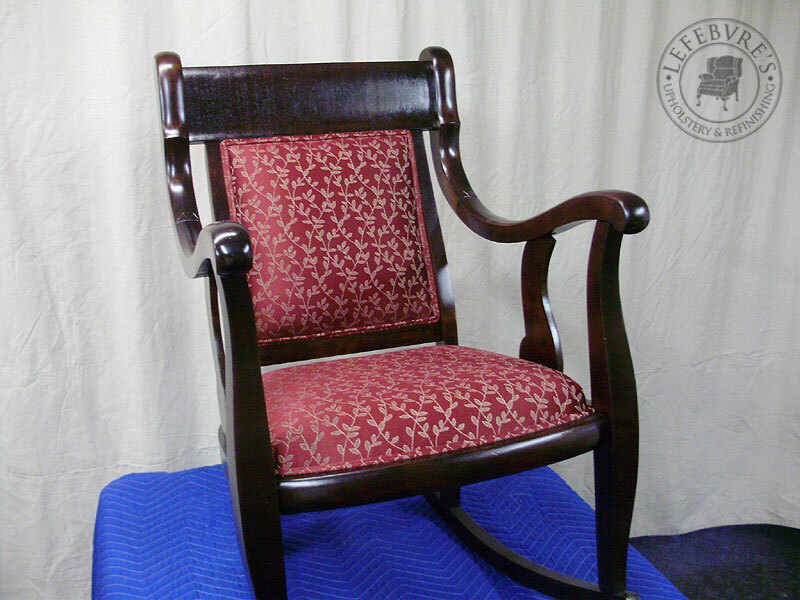 Here are the three pieces completely repaired, refinished, and upholstered in a lovely dark red/burgundy. 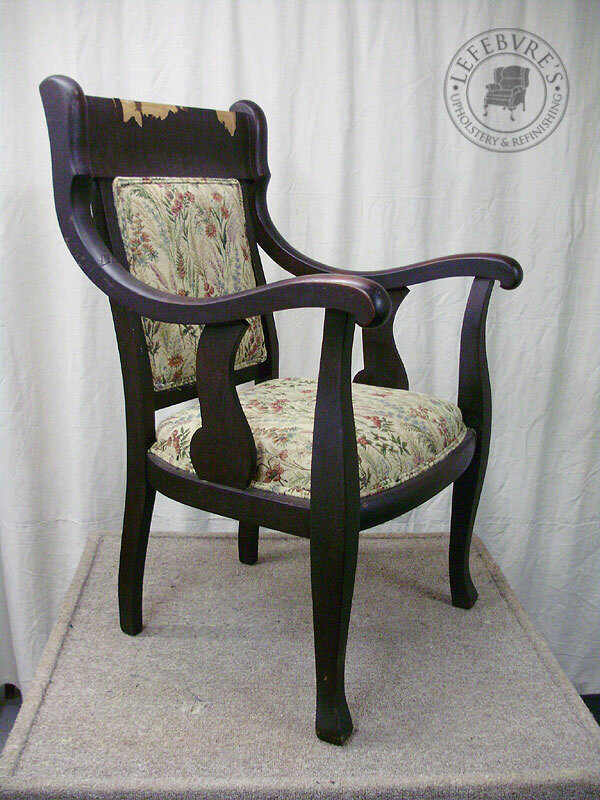 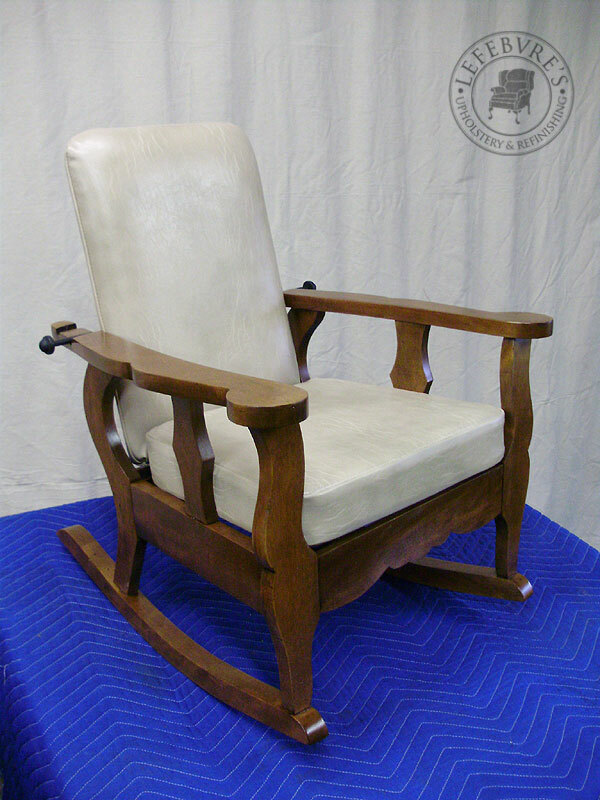 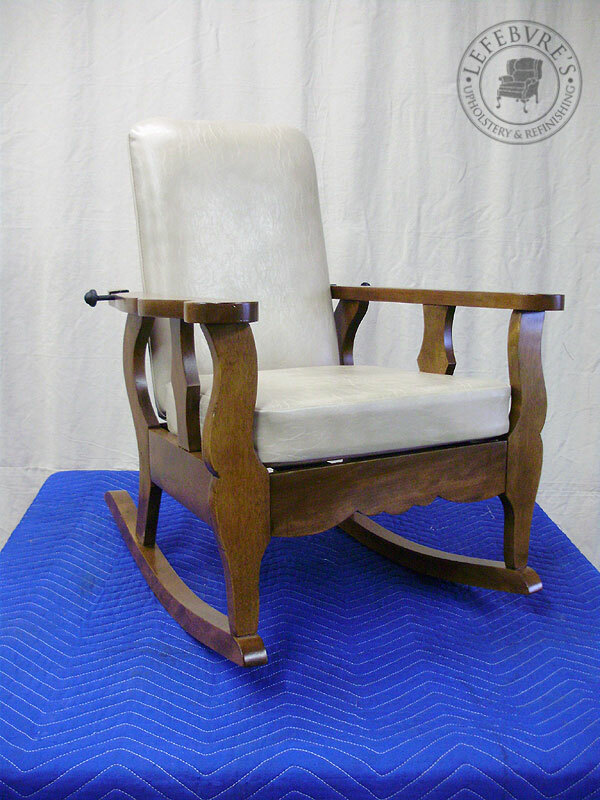 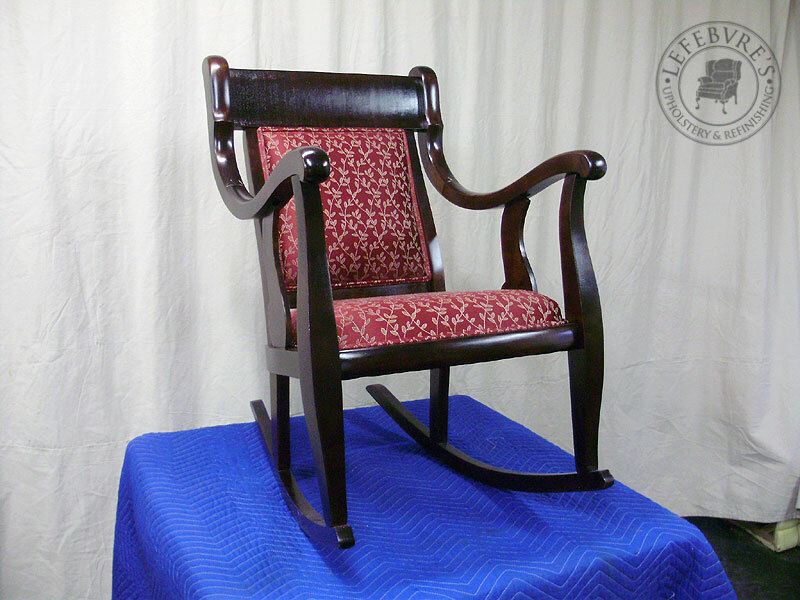 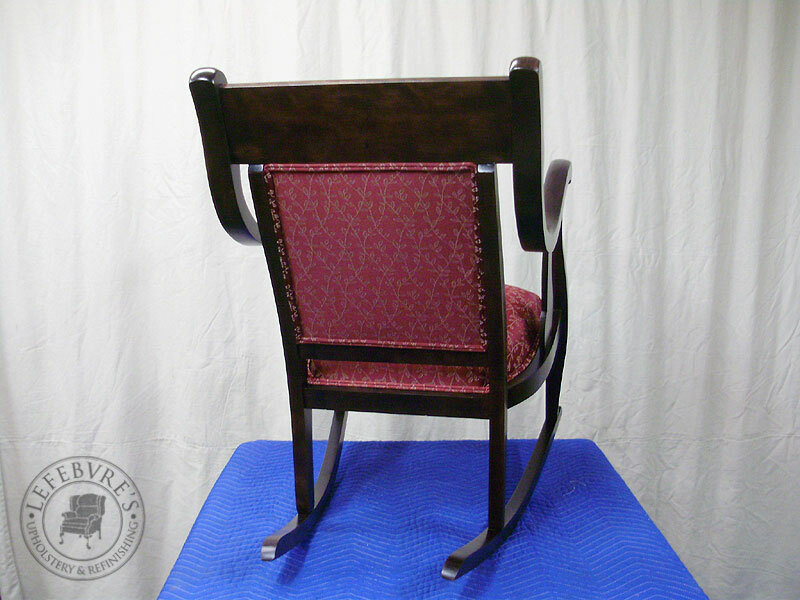 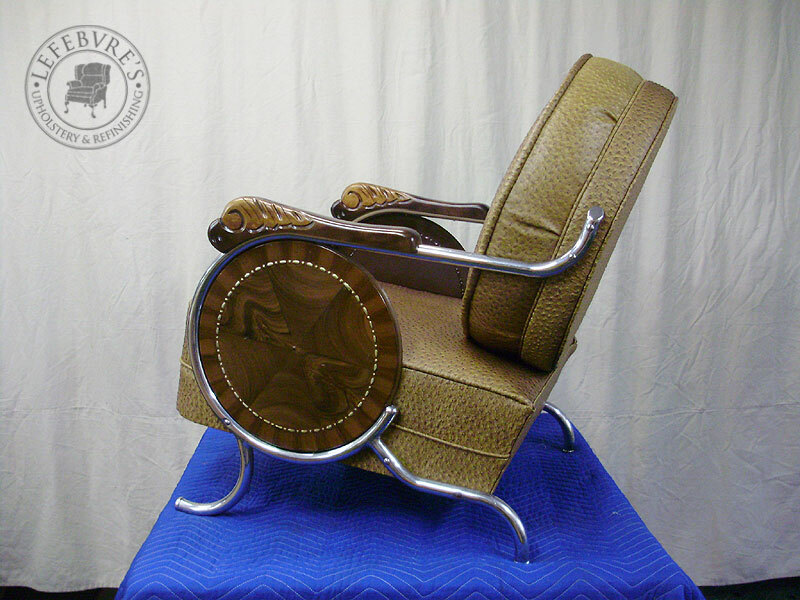 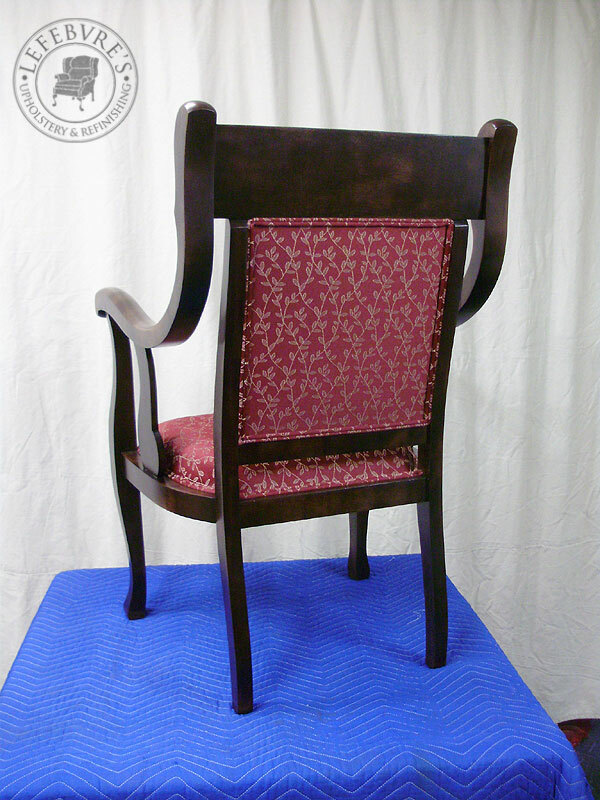 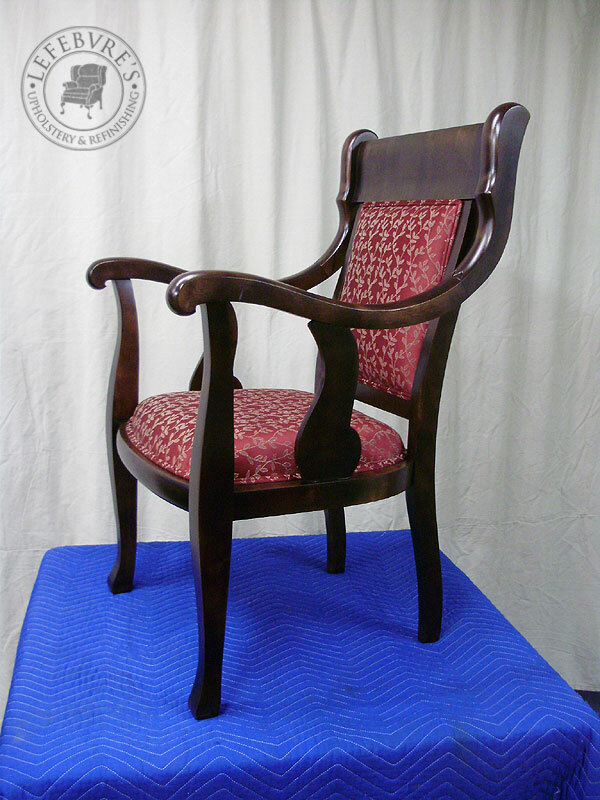 The chair was the piece that needed the most severe veneer repairs, but I think they came out really well, and the client was very happy with them.